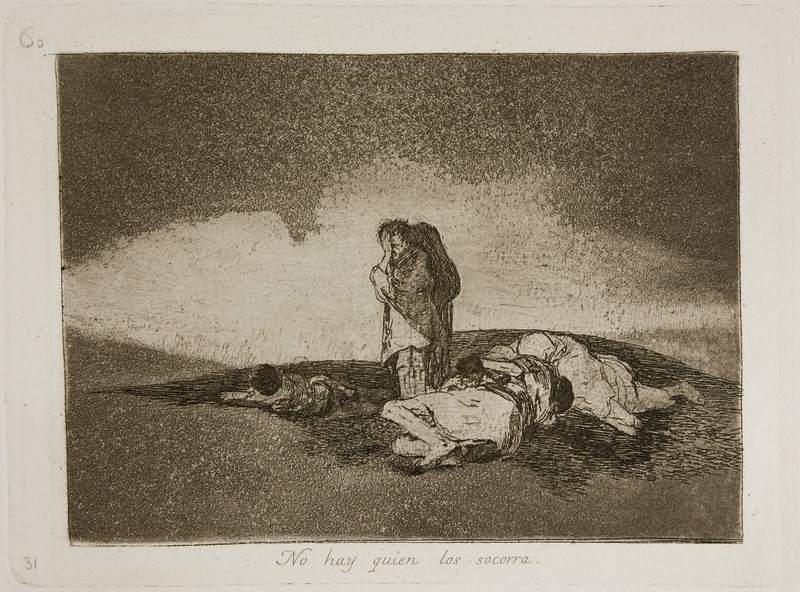 The Disasters of War /Los desastres de la guerra / I disastri della guerra are a series of 82 prints created between 1810 and 1820 by the Spanish painter and printmaker Francisco Goya (1746-1828). 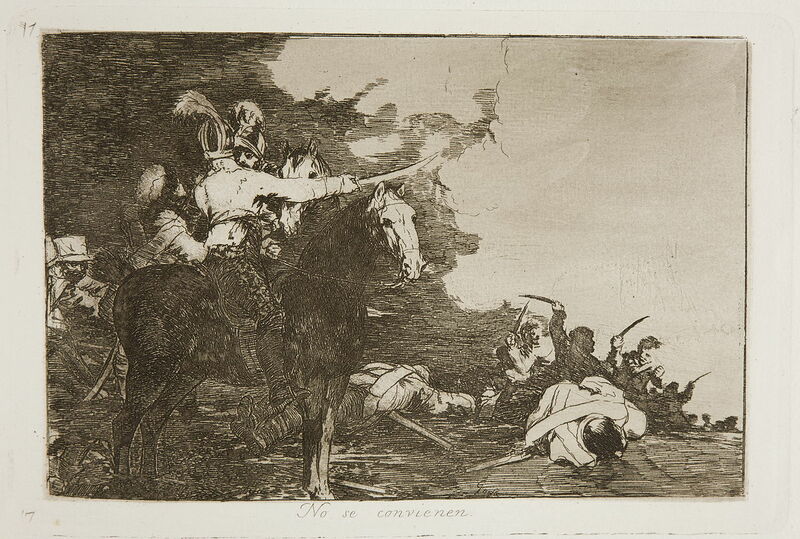 Although Goya did not make known his intention when creating the plates, art historians view them as a visual protest against the violence of the 1808 Dos de Mayo Uprising, the subsequent Peninsular War of 1808-14 and the setbacks to the liberal cause following the restoration of the Bourbon monarchy in 1814. 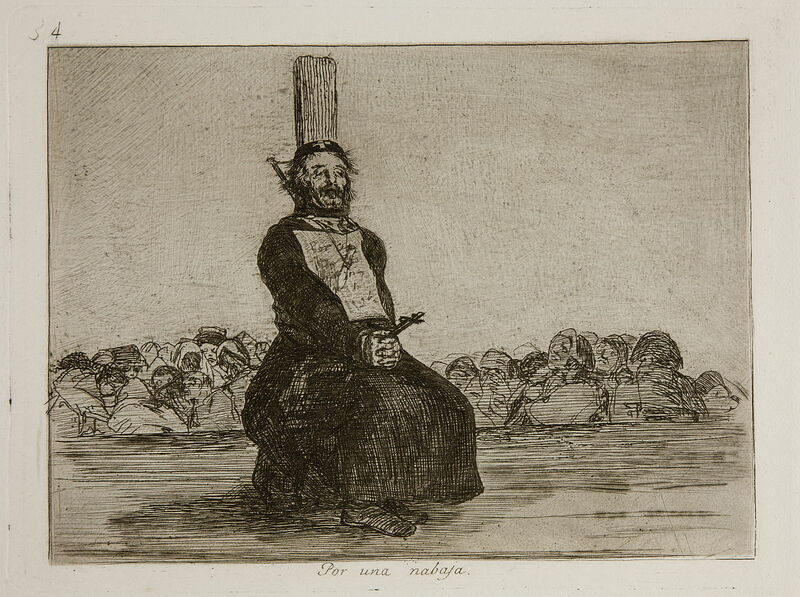 During the conflicts between Napoleon's French Empire and Spain, Goya retained his position as first court painter to the Spanish crown and continued to produce portraits of the Spanish and French rulers. 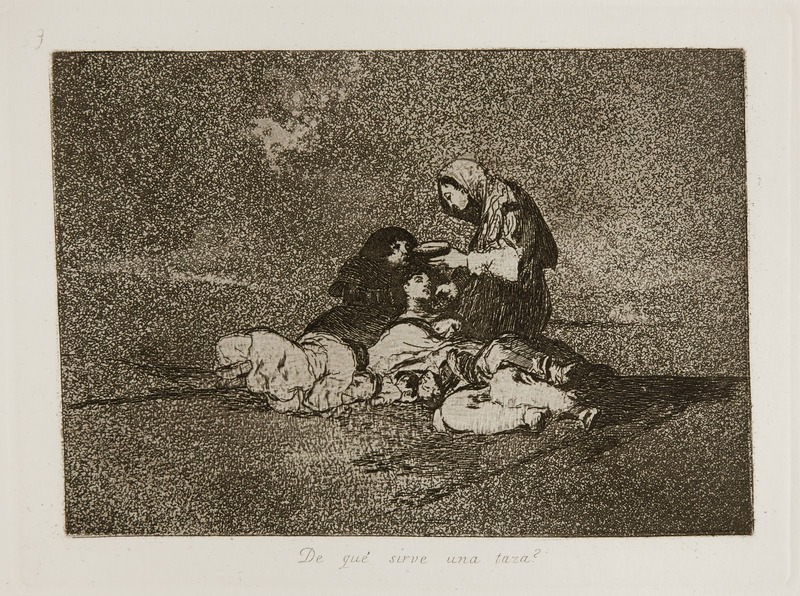 Although deeply affected by the war, he kept private his thoughts on the art he produced in response to the conflict and its aftermath. 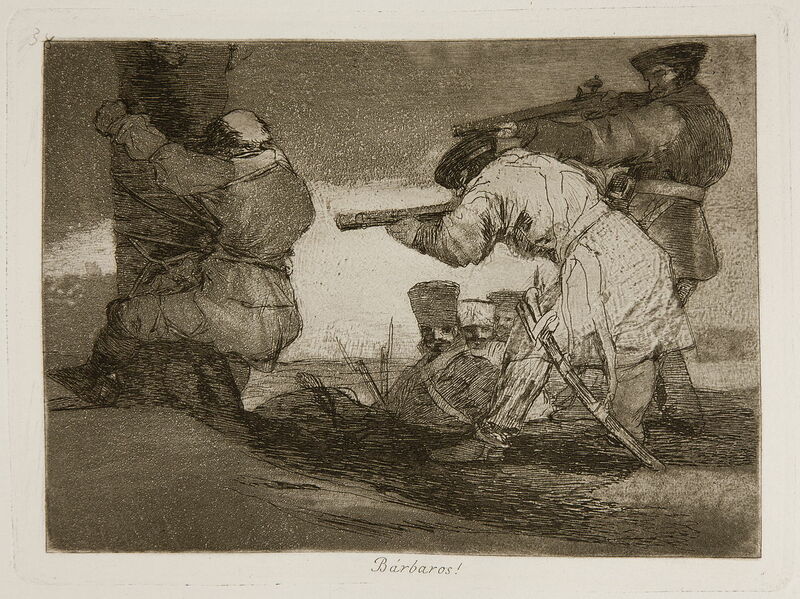 He was in poor health and almost deaf when, at 62, he began work on the prints. 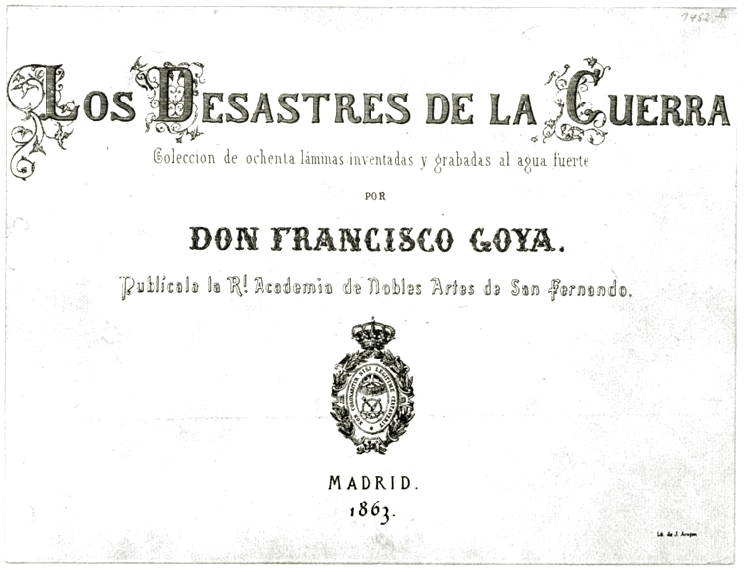 They were not published until 1863, 35 years after his death. 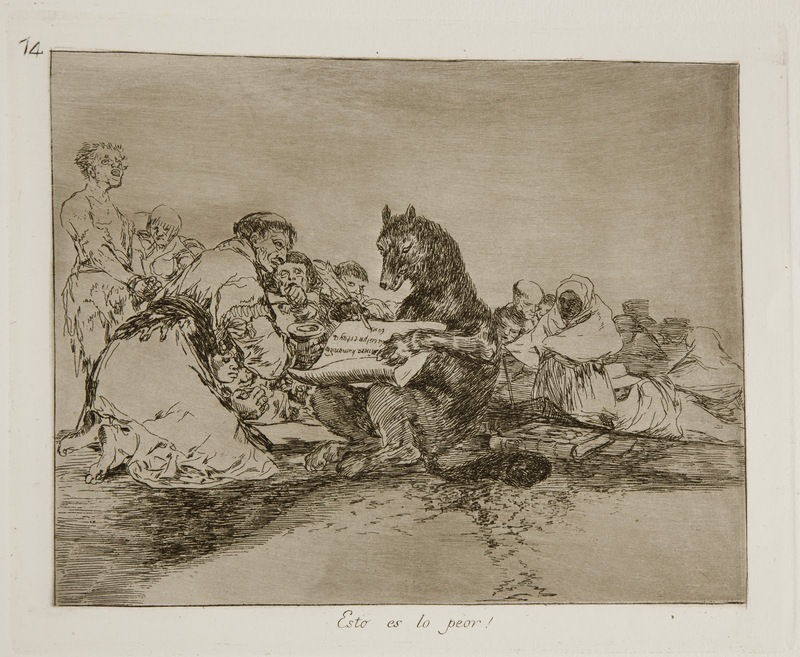 It is likely that only then was it considered politically safe to distribute a sequence of artworks criticising both the French and restored Bourbons. 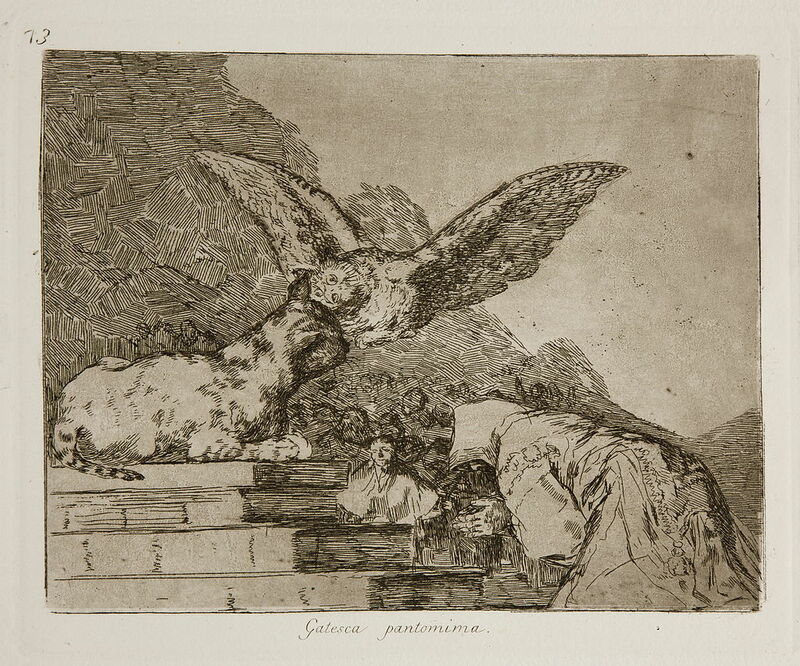 In total over a thousand sets have been printed, though later ones are of lower quality, and most print room collections have at least some of the set. 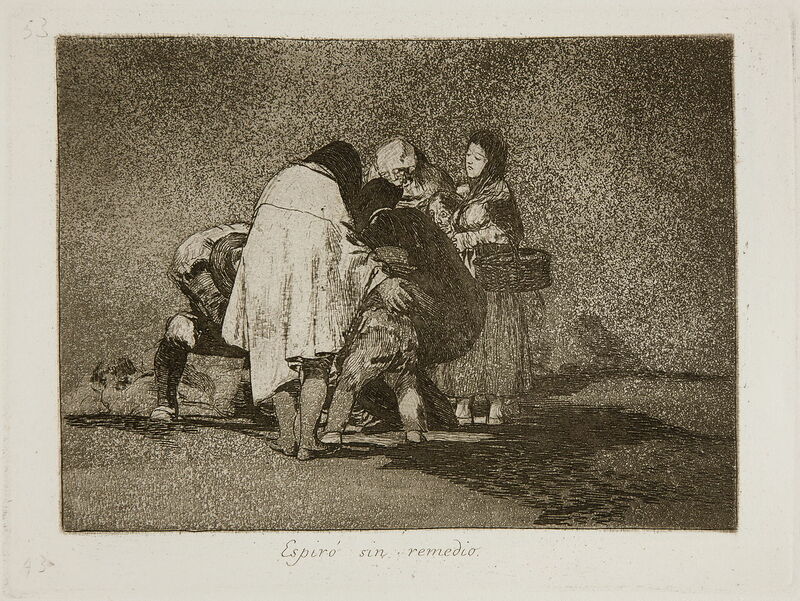 The series was produced using a variety of intaglio printmaking techniques, mainly etching for the line work and aquatint for the tonal areas, but also engraving and drypoint. 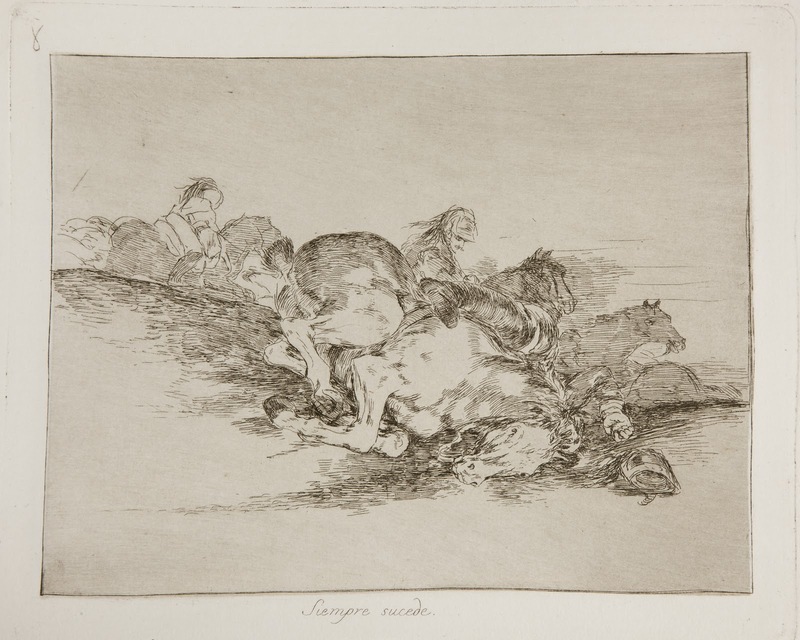 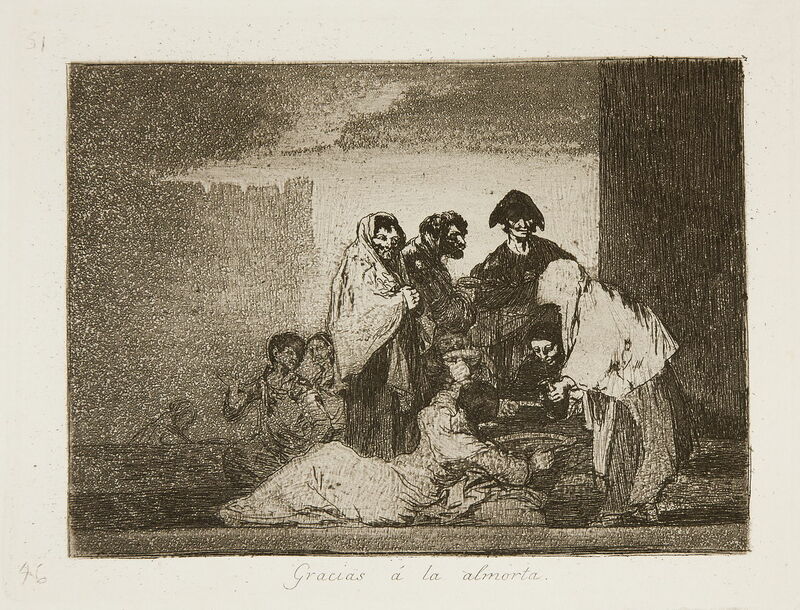 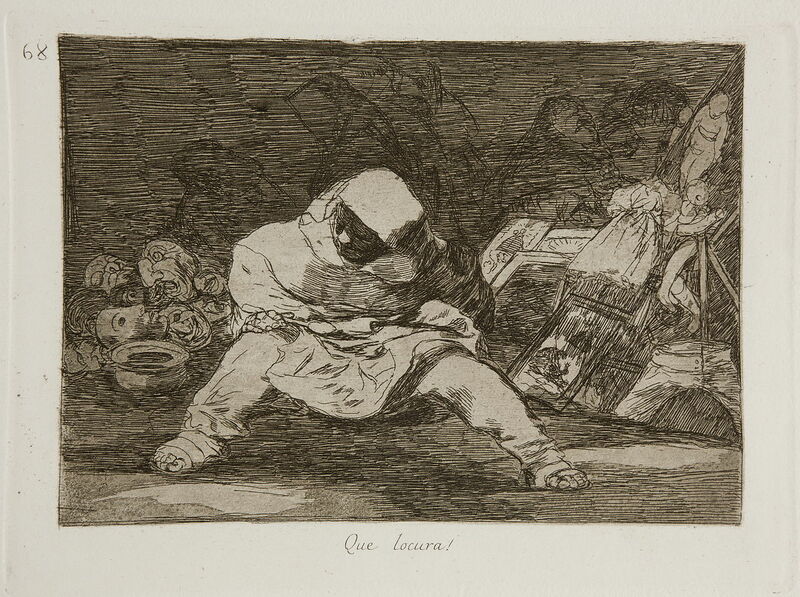 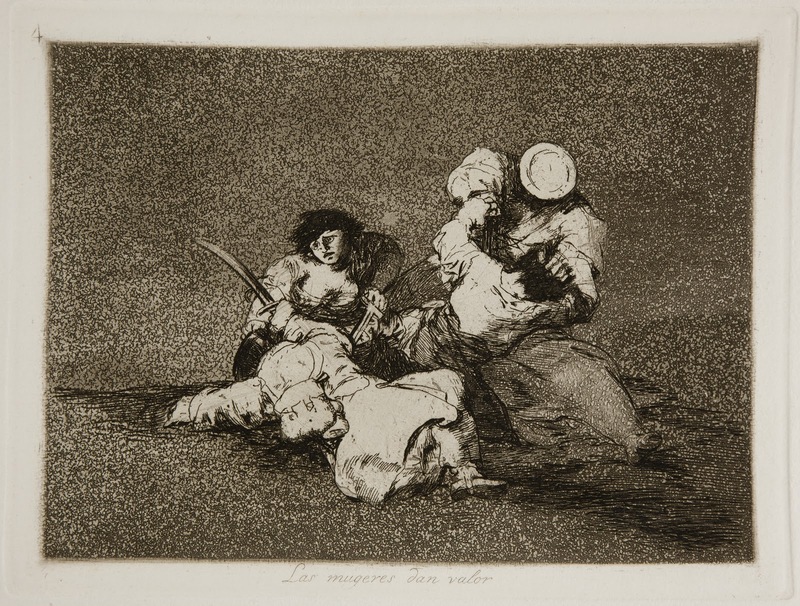 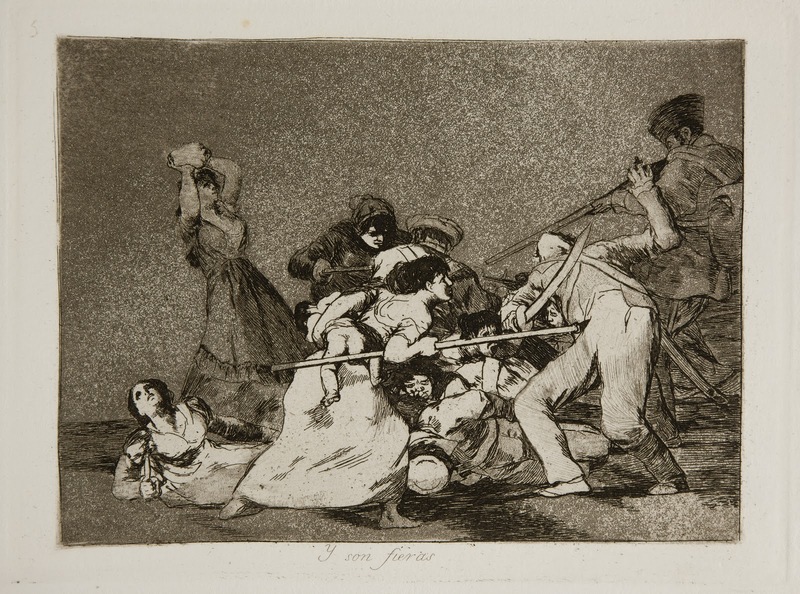 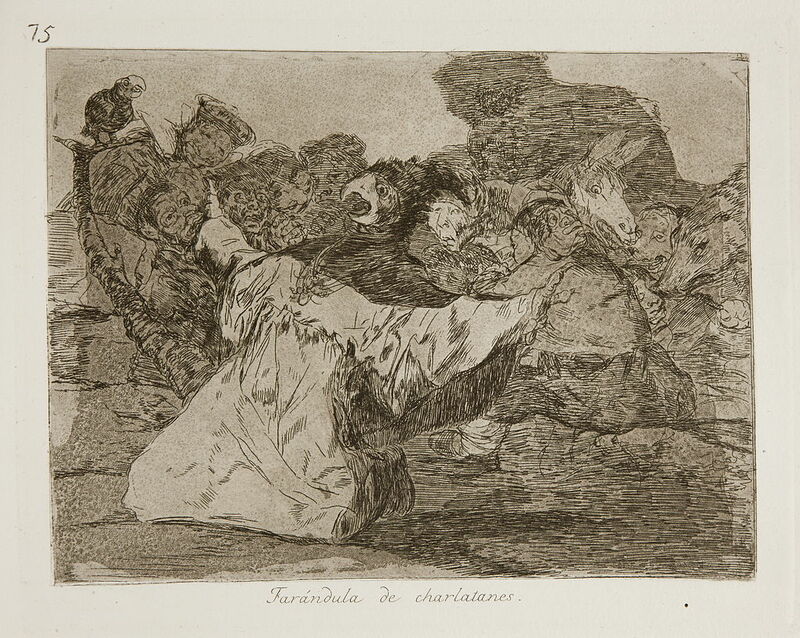 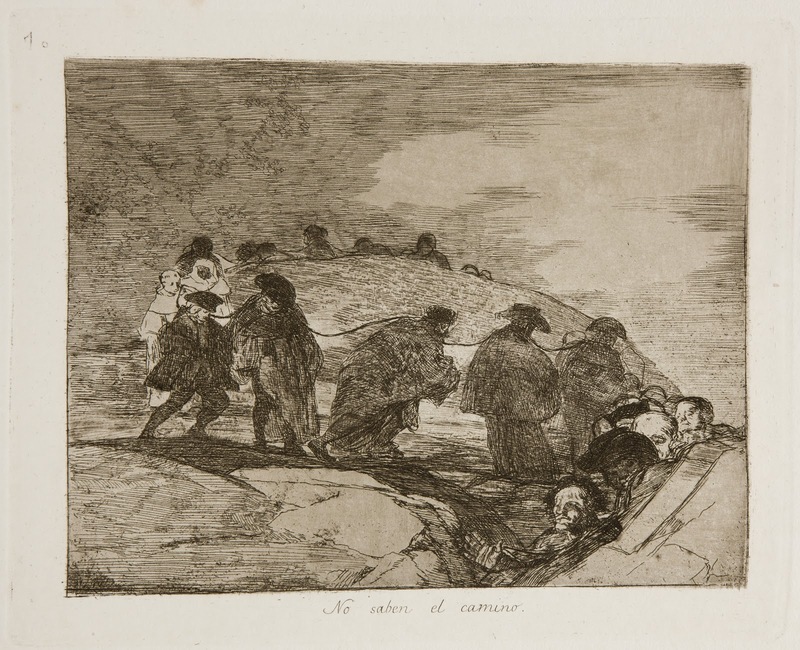 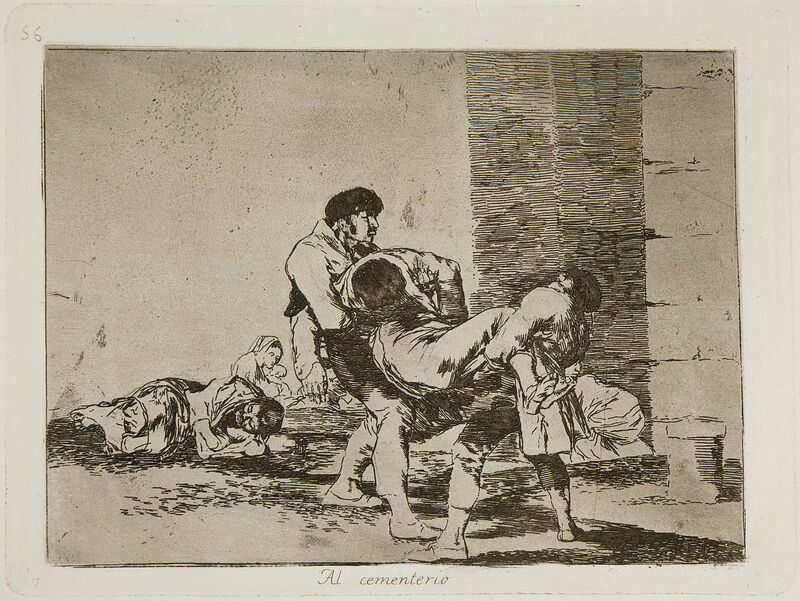 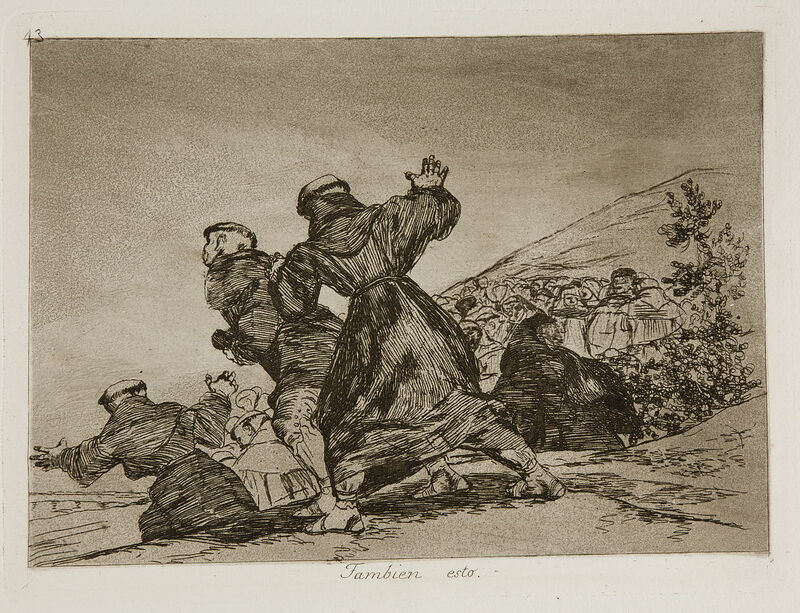 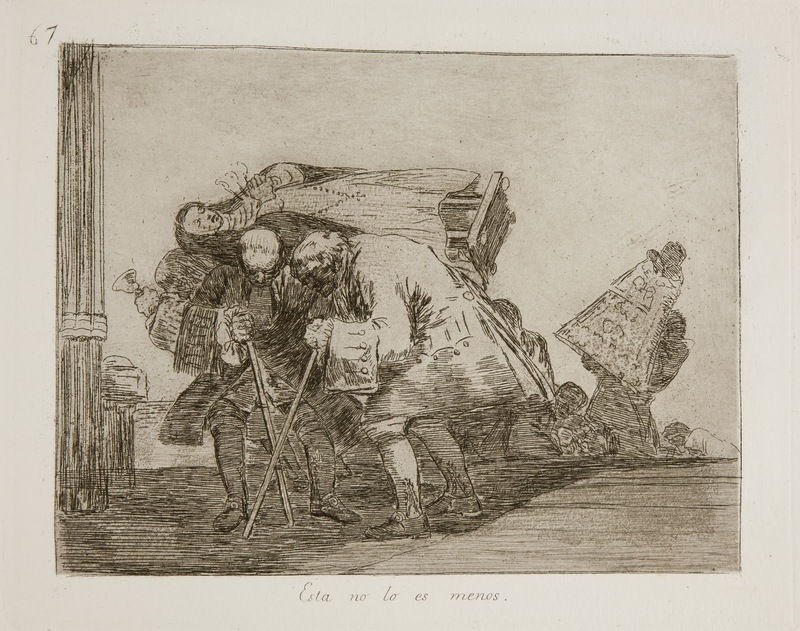 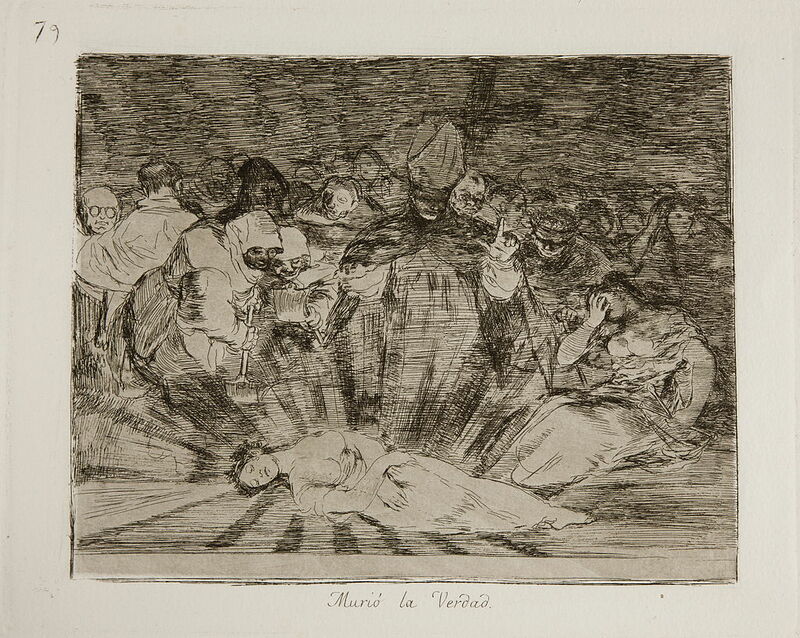 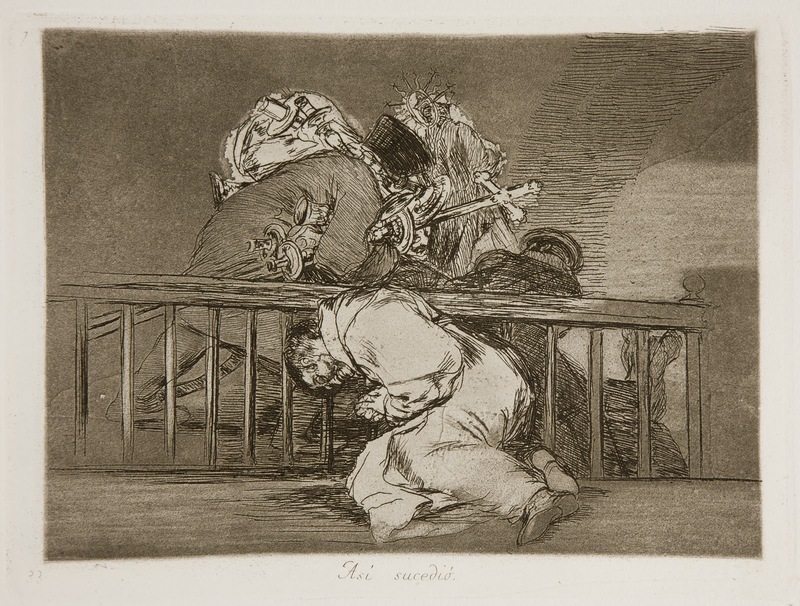 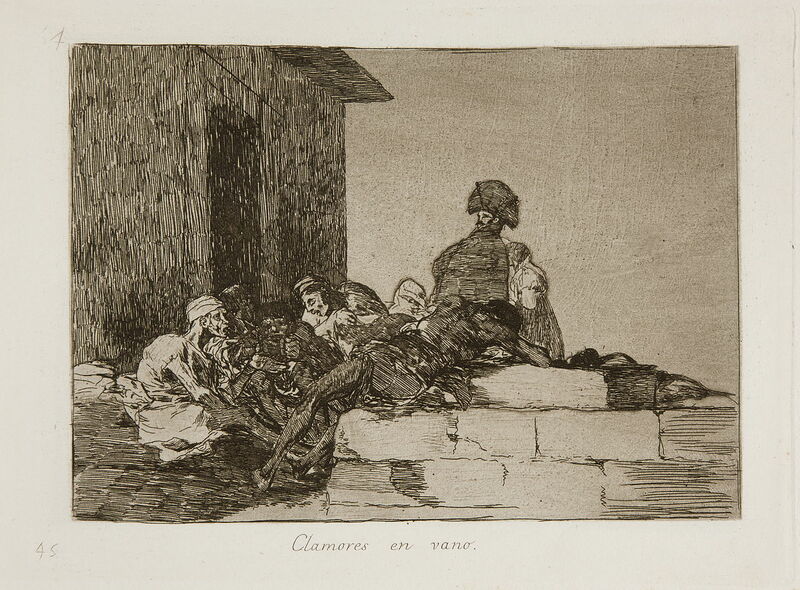 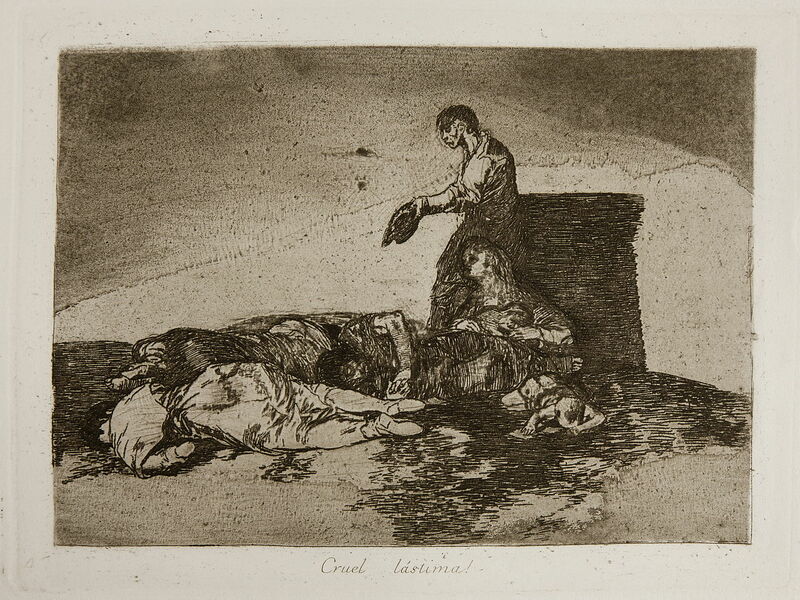 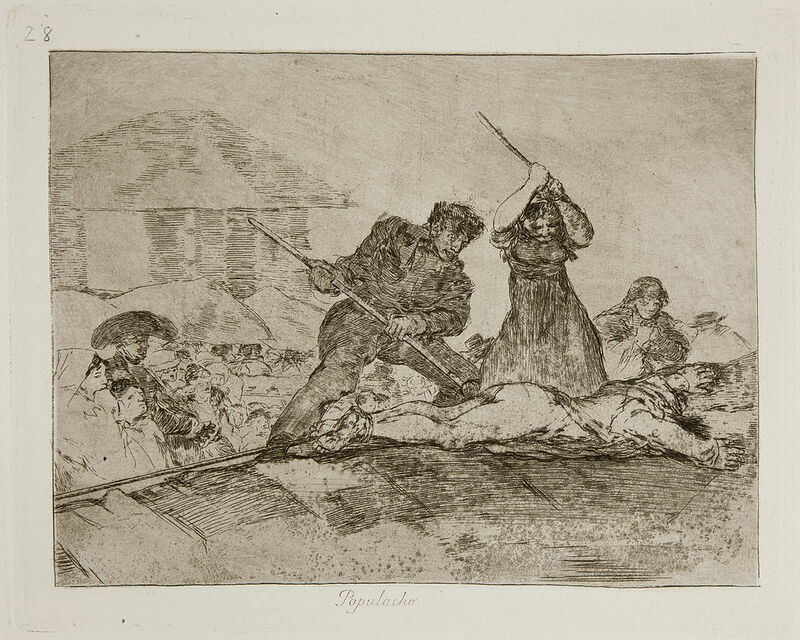 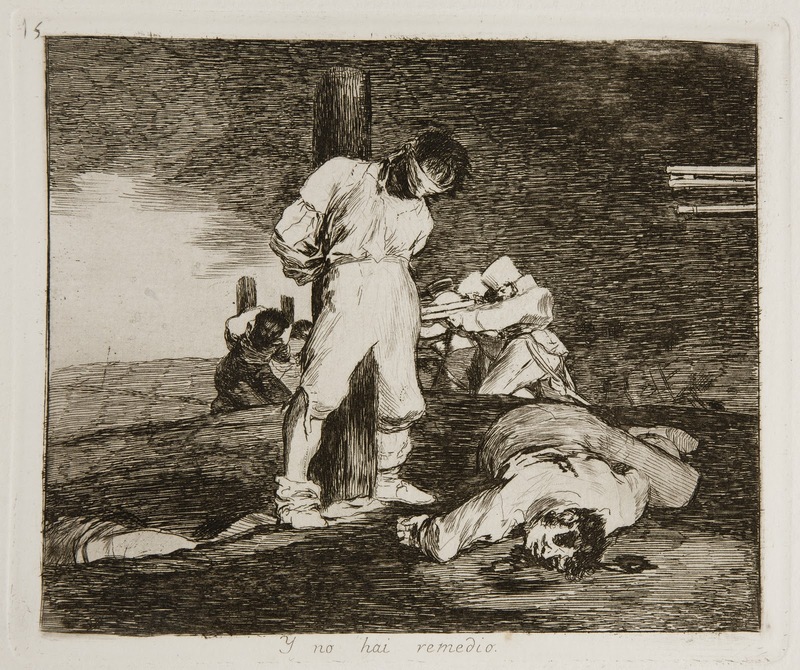 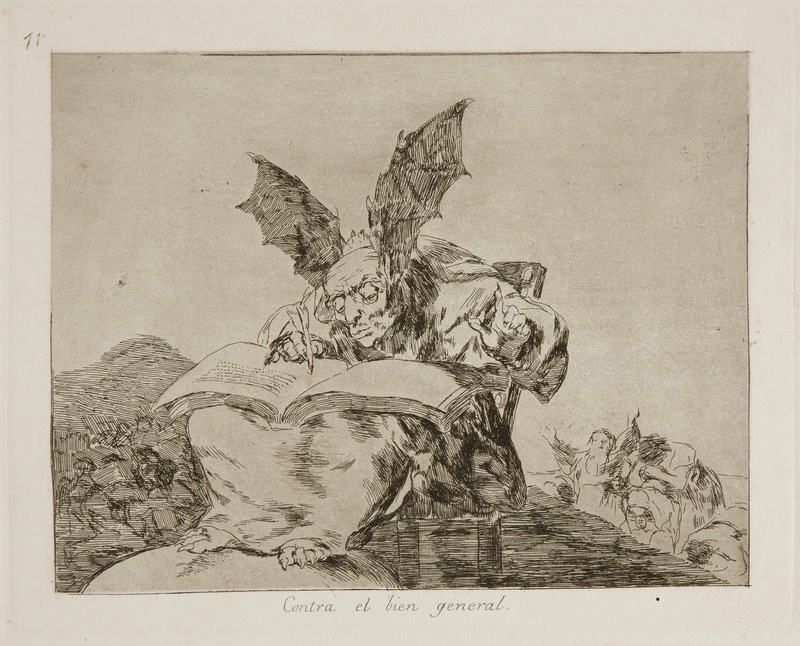 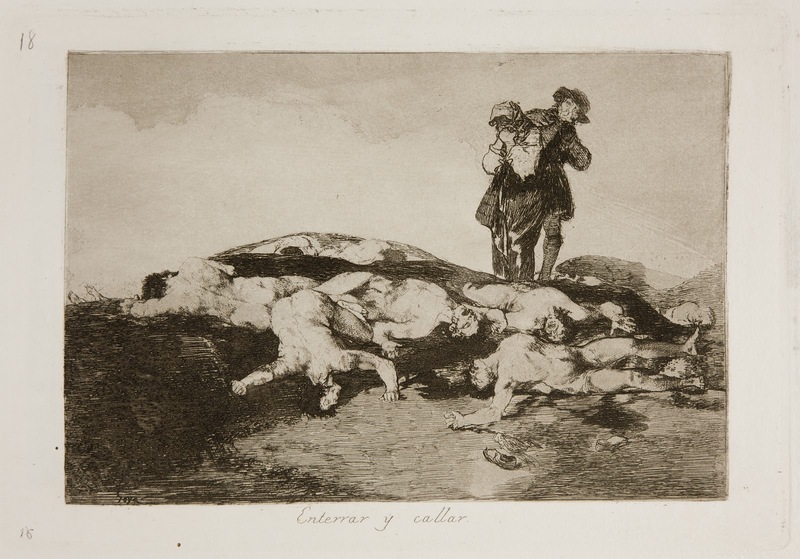 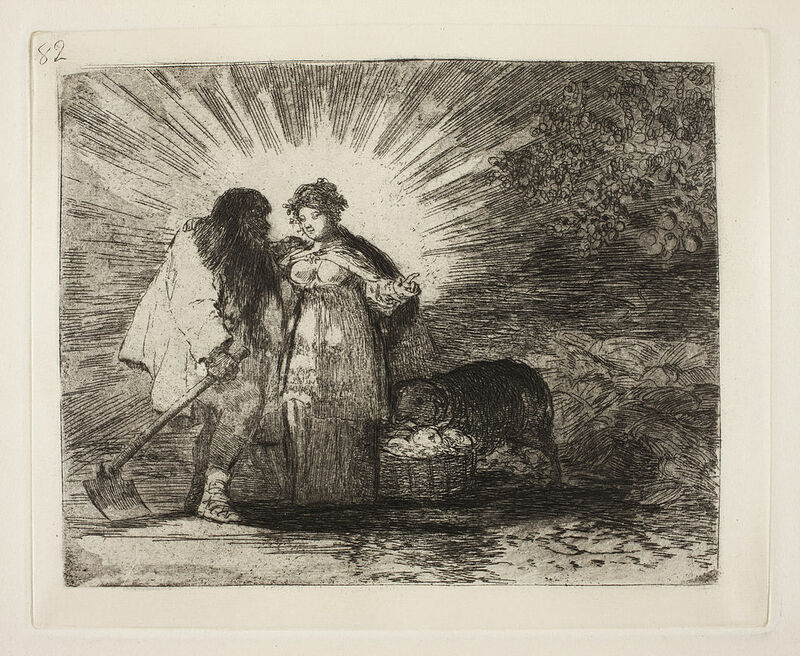 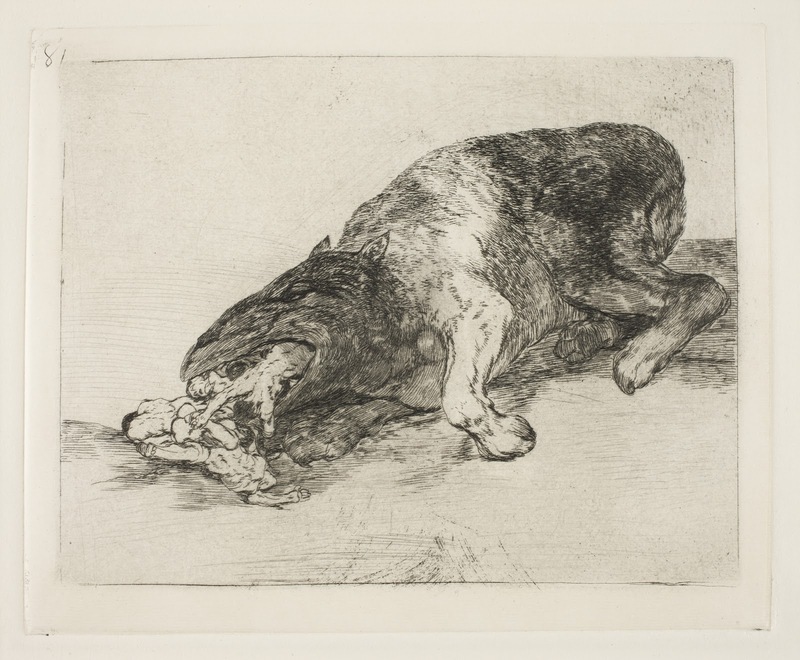 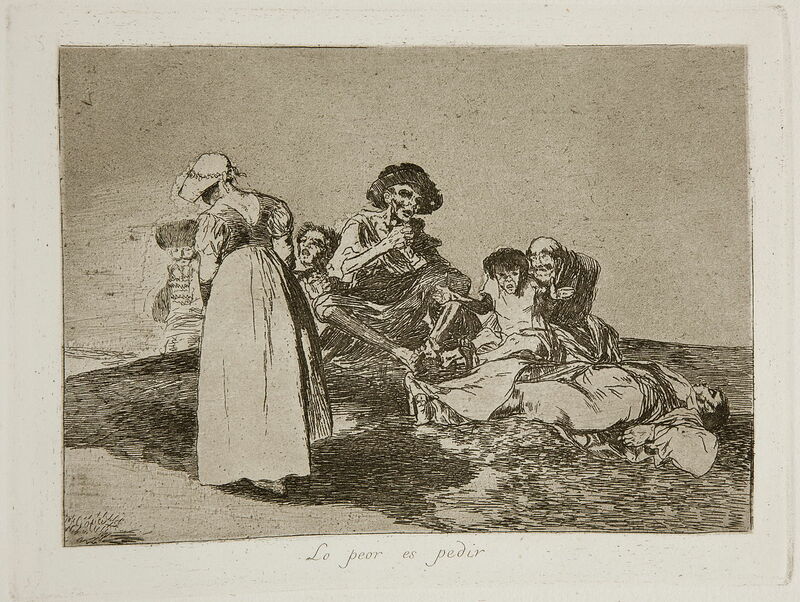 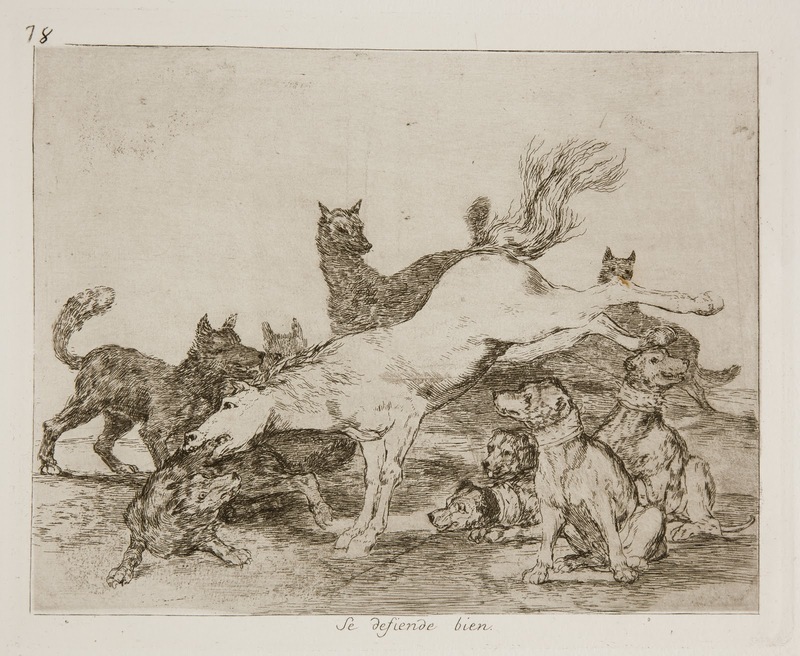 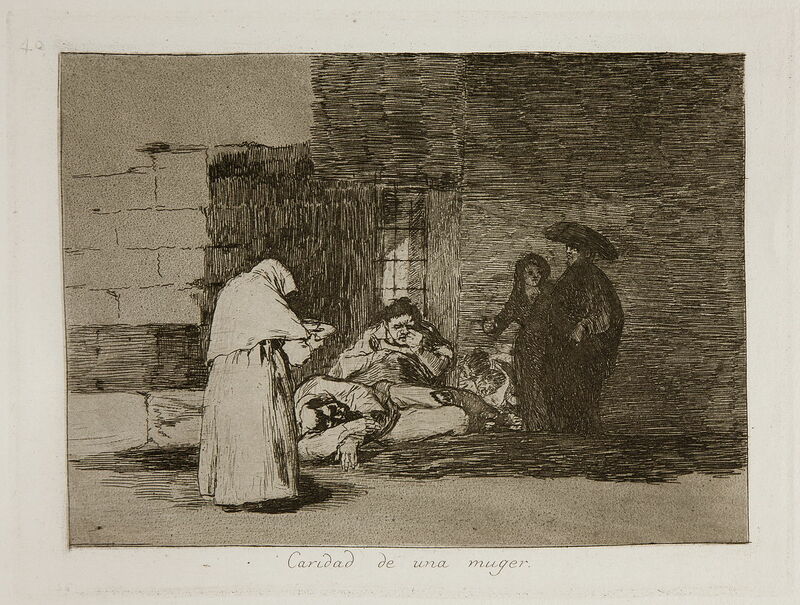 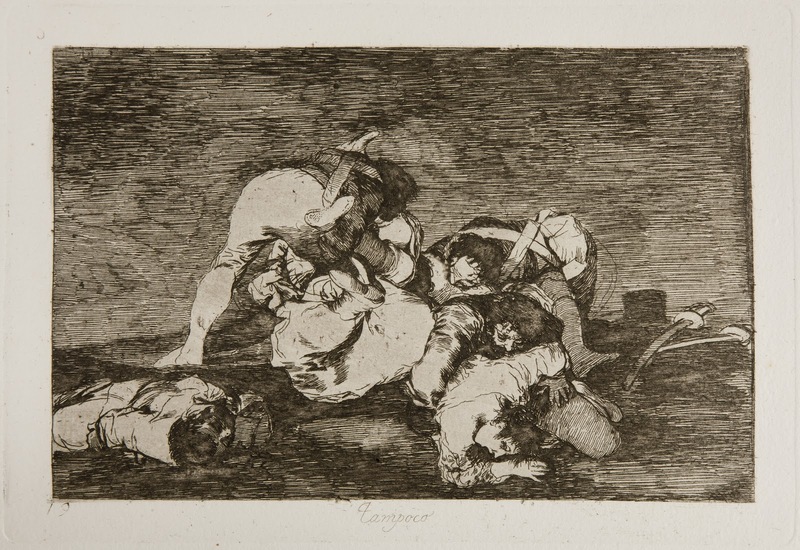 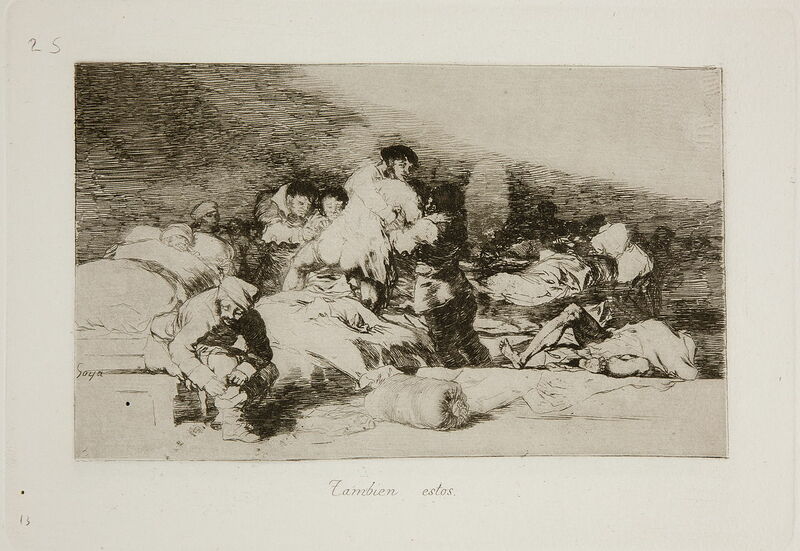 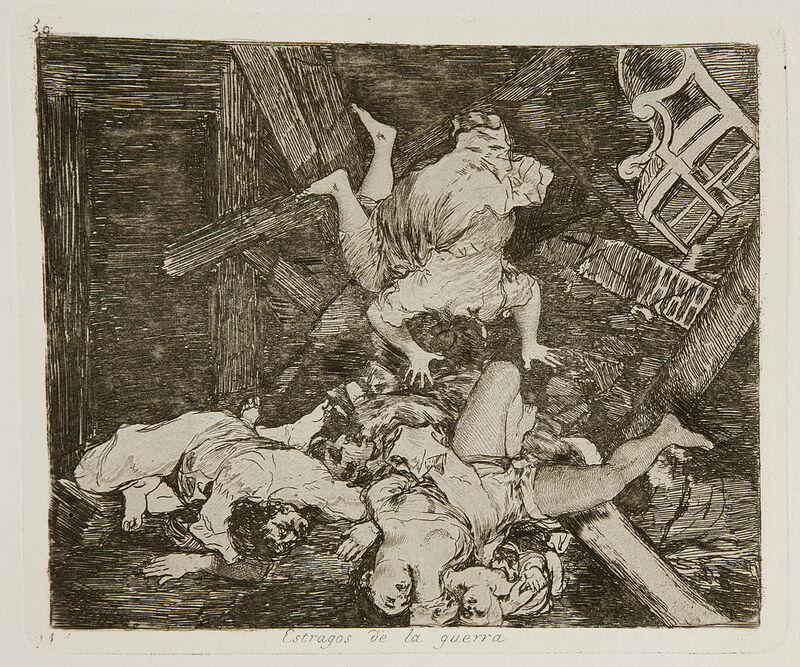 As with many other Goya prints, they are sometimes referred to as aquatints, but more often as etchings. 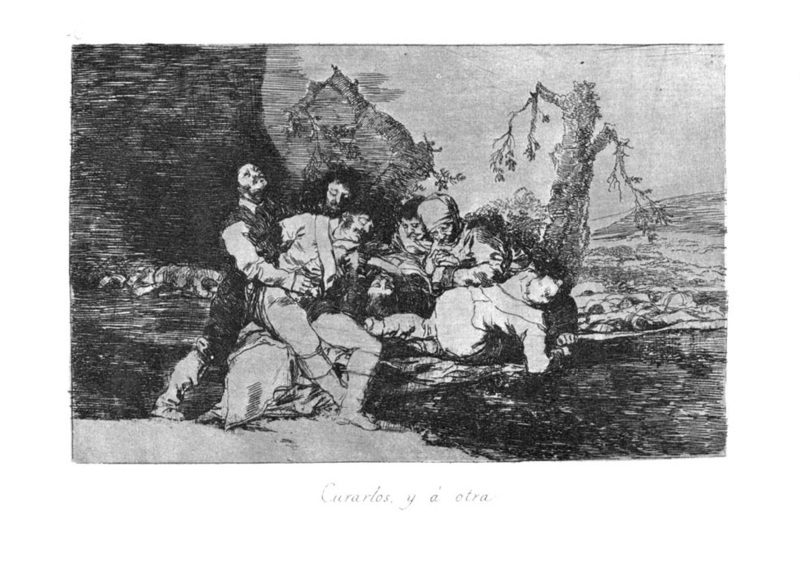 The series is usually considered in three groups which broadly mirror the order of their creation. 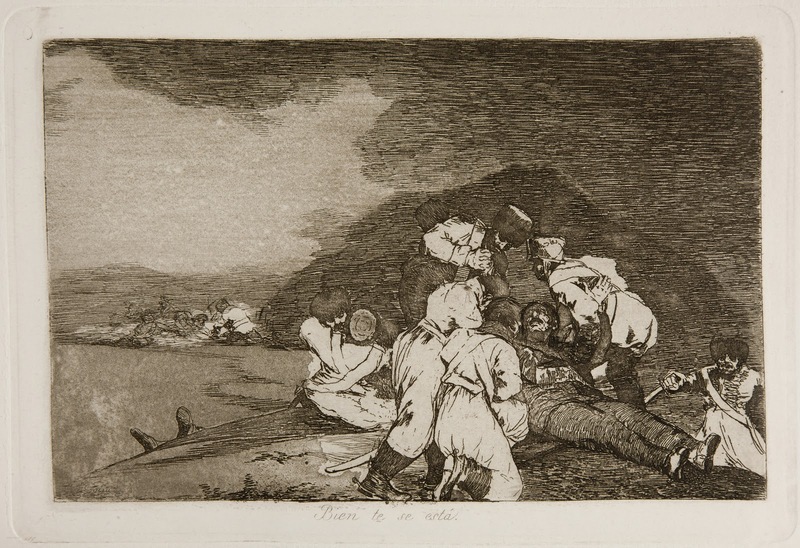 The first 47 focus on incidents from the war and show the consequences of the conflict on individual soldiers and civilians. 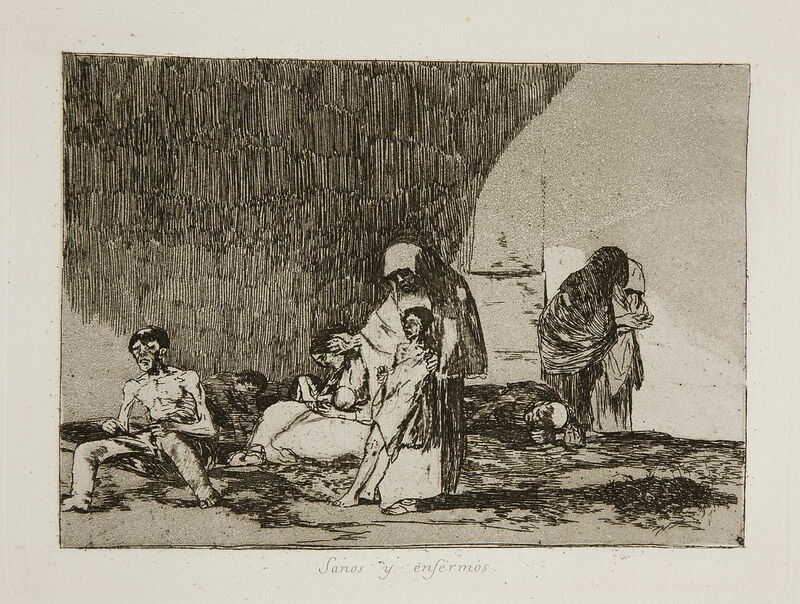 The middle series (plates 48 to 64) record the effects of the famine that hit Madrid in 1811-12, before the city was liberated from the French. 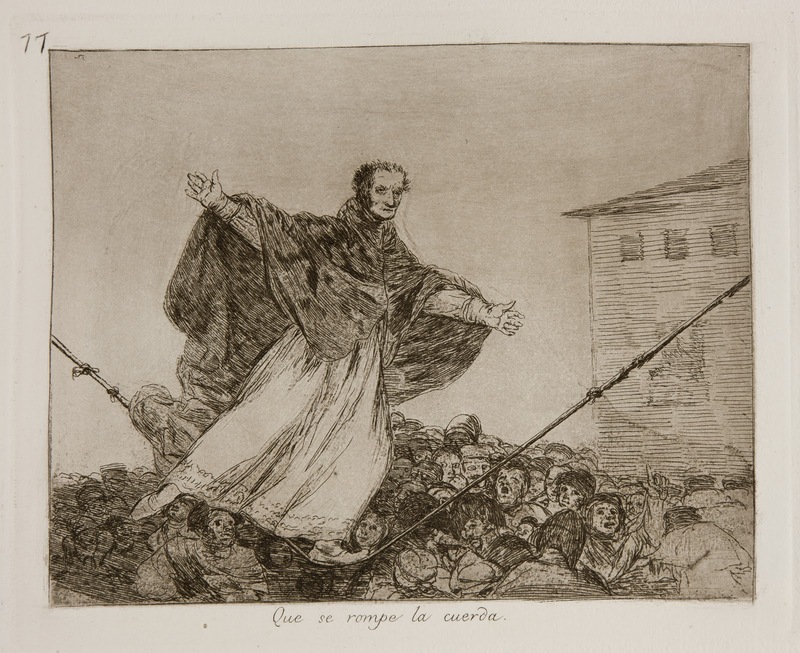 The final 17 reflect the bitter disappointment of liberals when the restored Bourbon monarchy, encouraged by the Catholic hierarchy, rejected the Spanish Constitution of 1812 and opposed both state and religious reform. 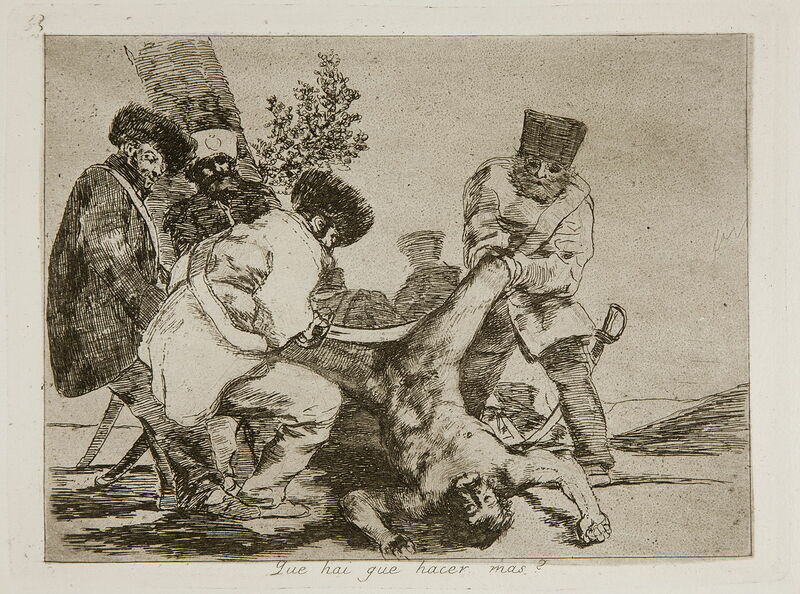 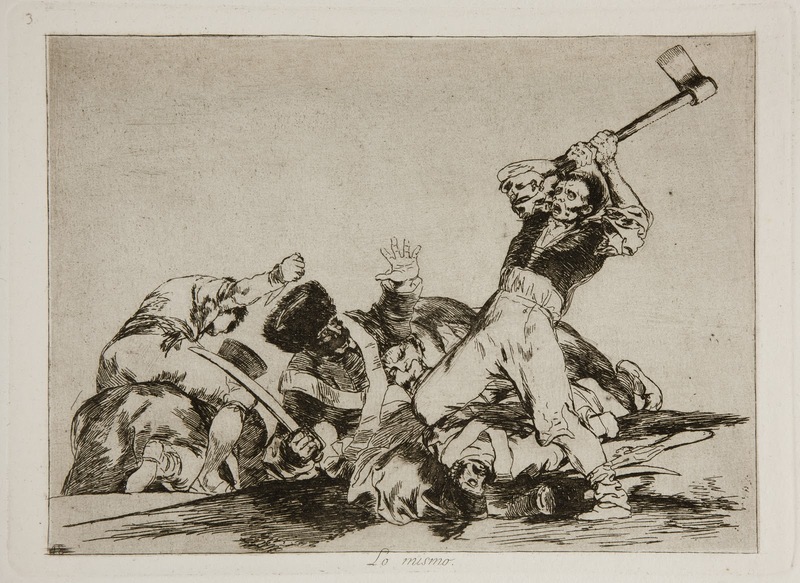 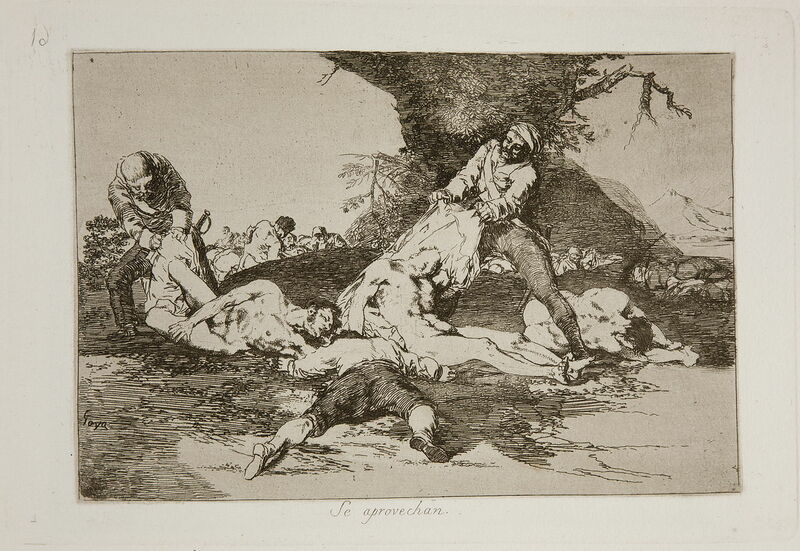 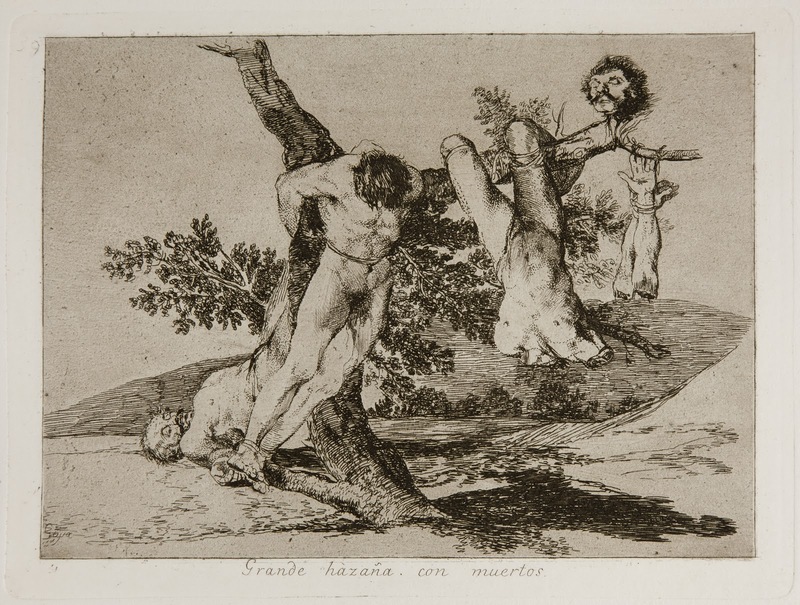 Goya's scenes of atrocities, starvation, degradation and humiliation have been described as the "prodigious flowering of rage" The serial nature in which the plates unfold has led some to see the images as similar in nature to photography. 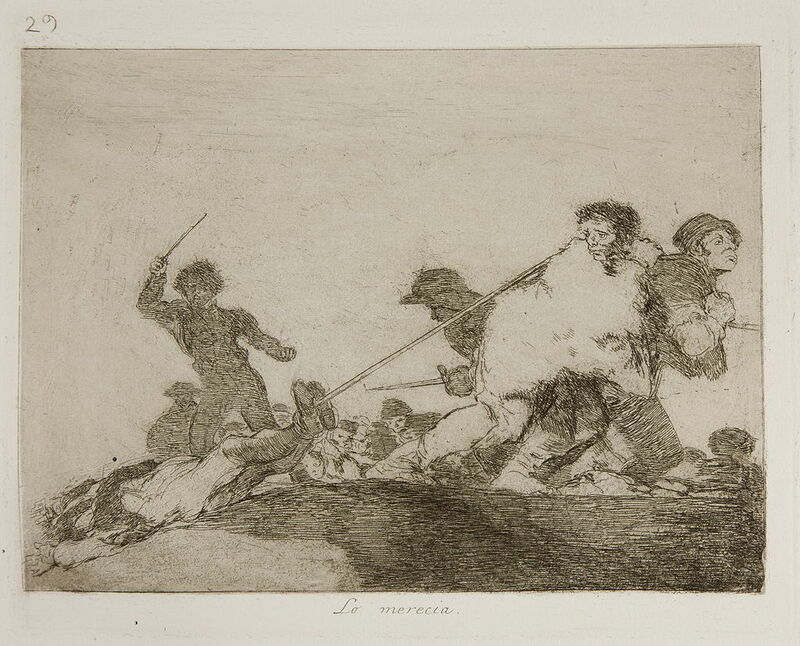 French forces invaded Spain in 1808, leading to the Peninsular War of 1808-1814. 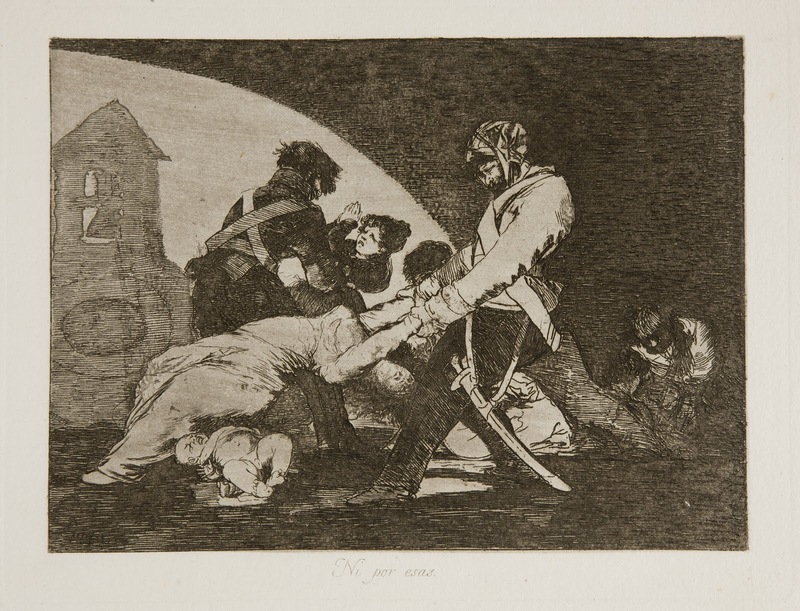 The extent of Goya's involvement with the court of the "Intruder king", Joseph I, the brother of Napoleon Bonaparte, is not known; he painted works for French patrons and sympathisers, but kept neutral during the fighting. 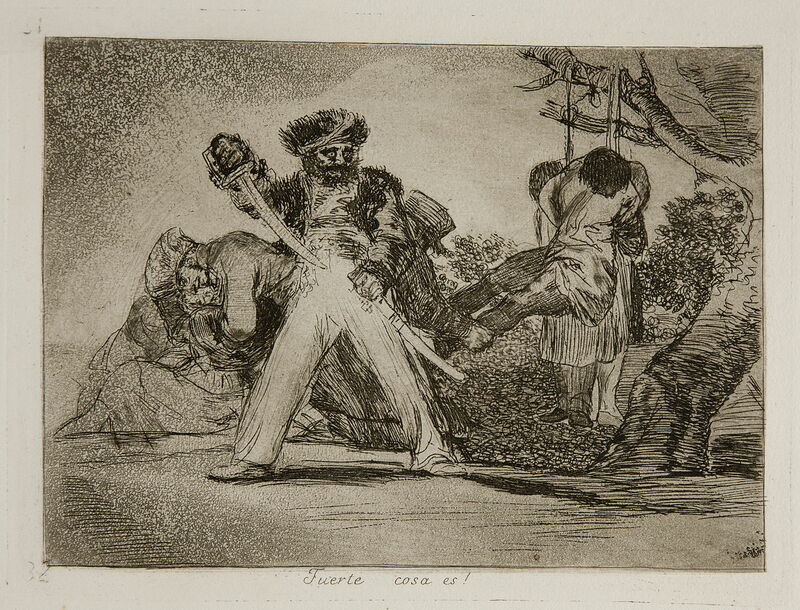 After the restoration of the Spanish king, Ferdinand VII, in 1814, Goya denied any involvement with the French. 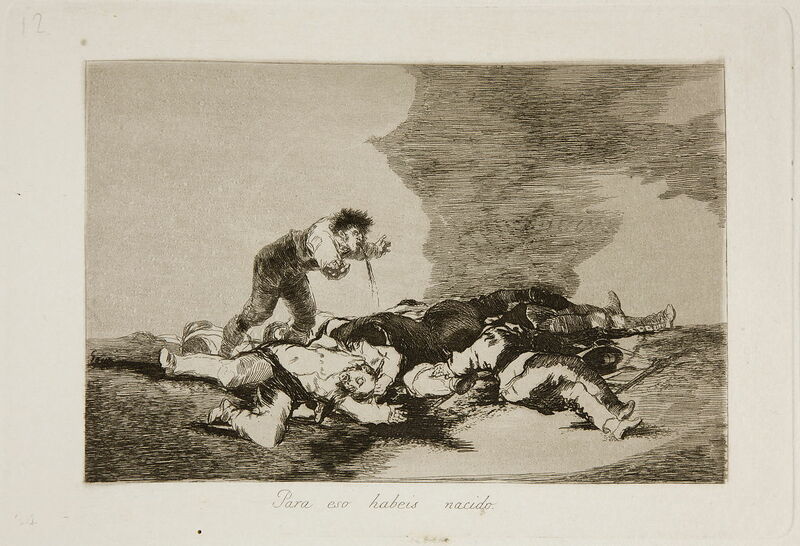 When his wife Josefa died in 1812, he was mentally and emotionally processing the war by painting The Second of May 1808 and The Third of May 1808, and preparing the series of prints later known as The Disasters of War (Los desastres de la guerra). 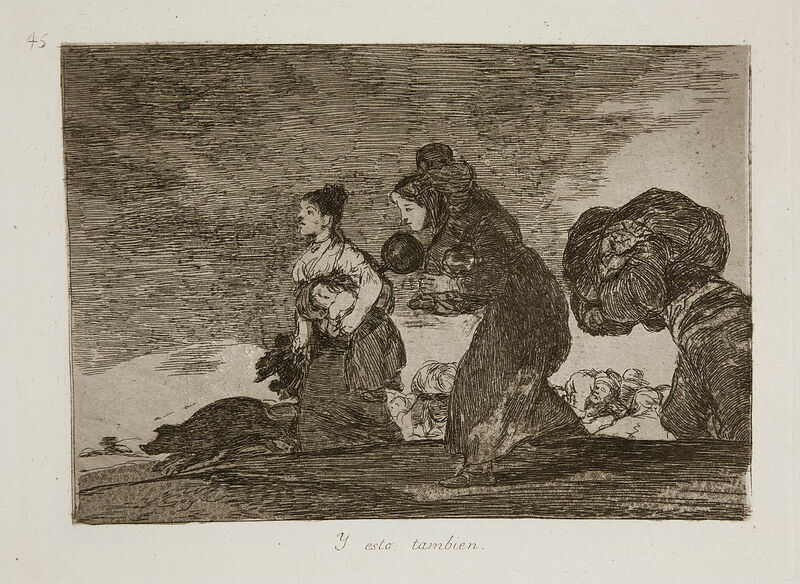 Ferdinand VII returned to Spain in 1814 but relations with Goya were not cordial. 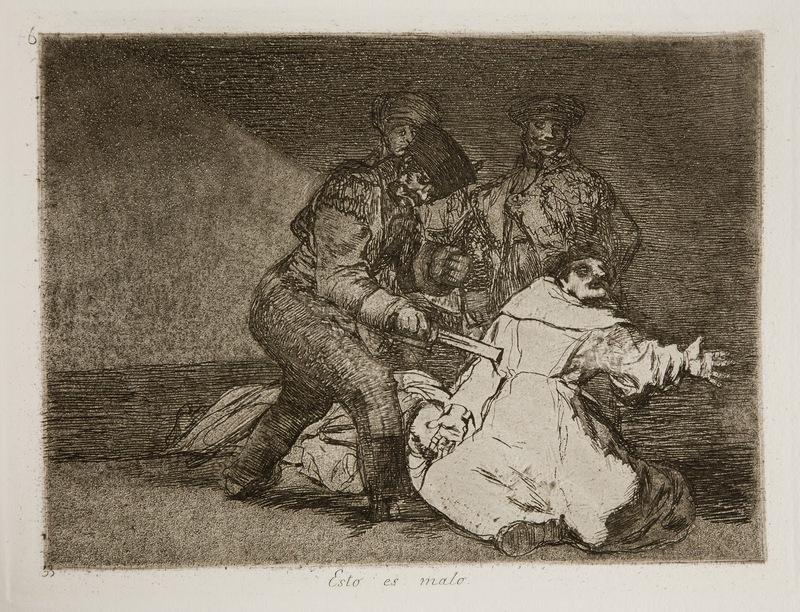 He painted portraits of the king for a variety of organizations, but not for the king himself. 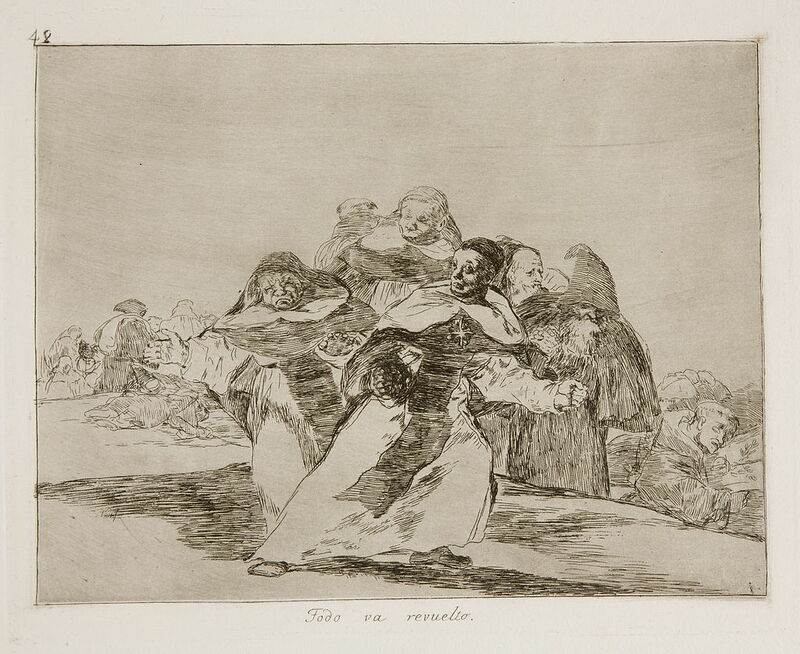 During a period of convalescence during 1793-1794, Goya completed a set of eleven small pictures painted on tin. 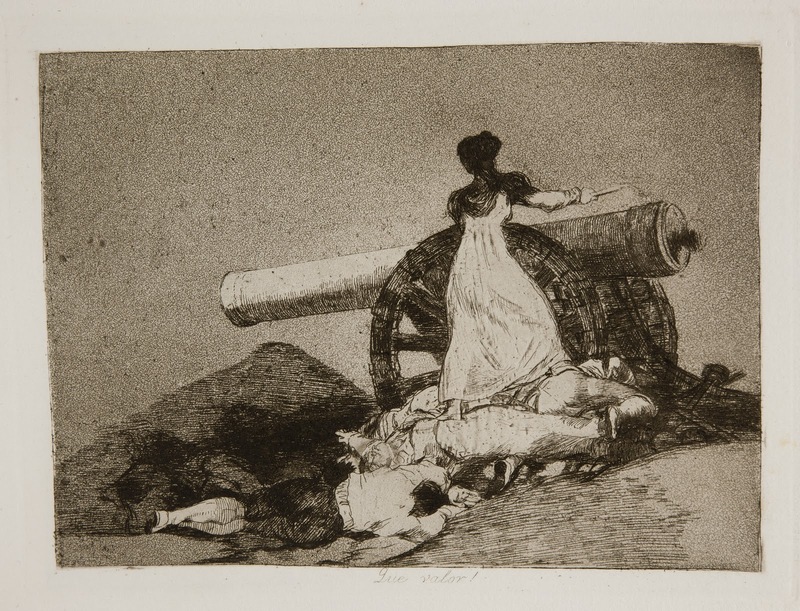 Known as Fantasy and Invention, they mark a significant change in the tone and subject matter of his art. 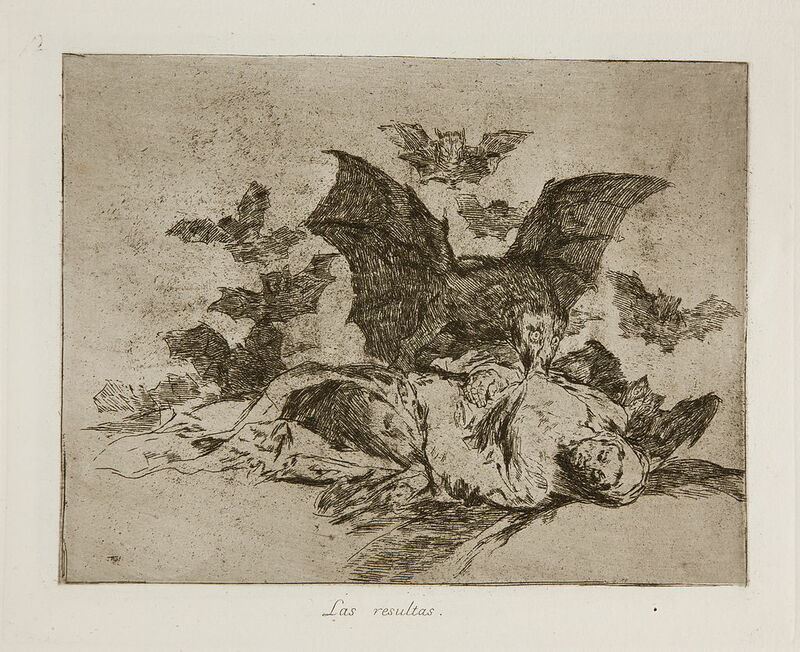 They draw from dark and dramatic realms of fantasy nightmare. 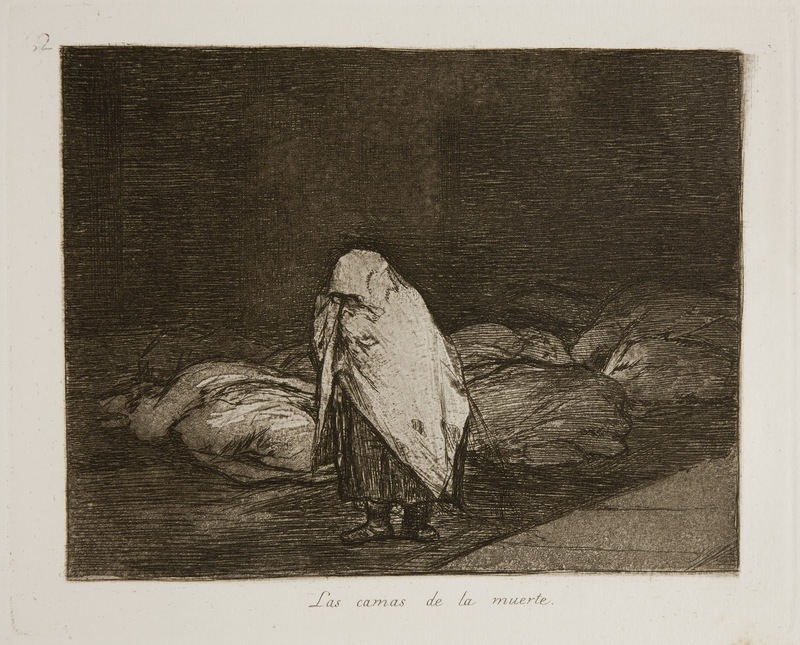 Yard with Lunatics is a horrifying, imaginary vision of loneliness, fear and social alienation. 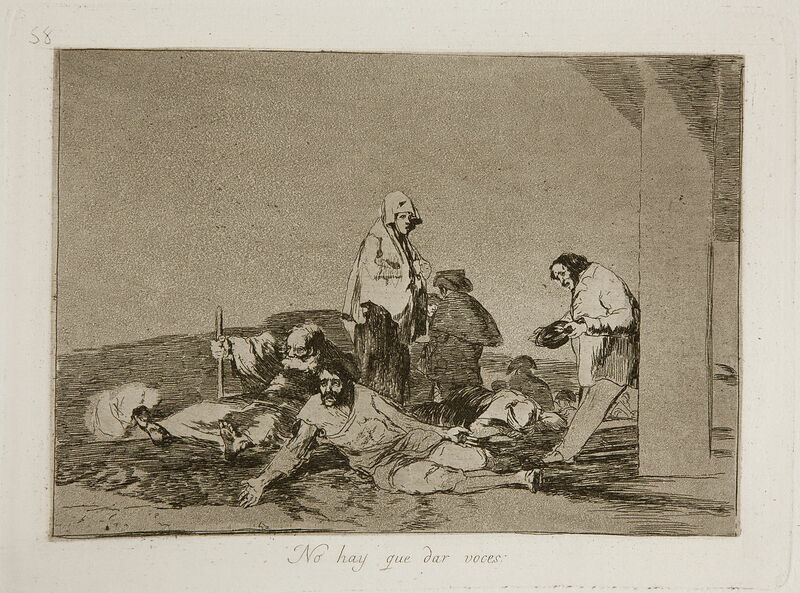 The condemnation of brutality towards prisoners (whether criminal or insane) is a subject that Goya assayed in later works that focused on the degradation of the human figure. 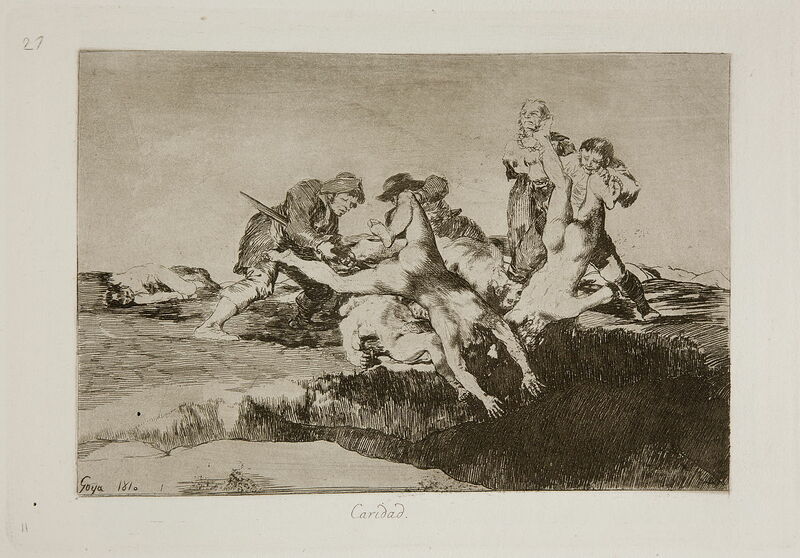 It was one of the first of Goya's mid-1790s cabinet paintings, in which his earlier search for ideal beauty gave way to an examination of the relationship between naturalism and fantasy that would preoccupy him for the rest of his career. 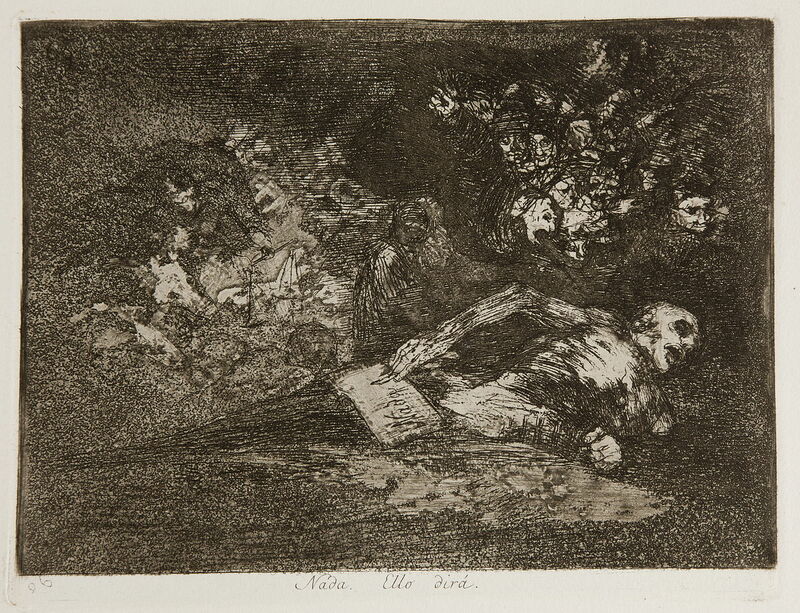 He was undergoing a nervous breakdown and entering prolonged physical illness, and admitted that the series was created to reflect his own self-doubt, anxiety and fear that he himself was going mad. 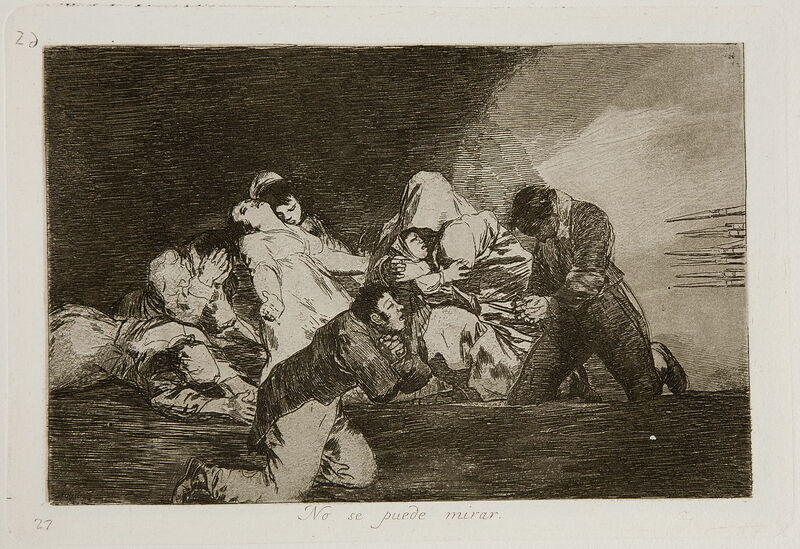 Goya wrote that the works served "to occupy my imagination, tormented as it is by contemplation of my sufferings". 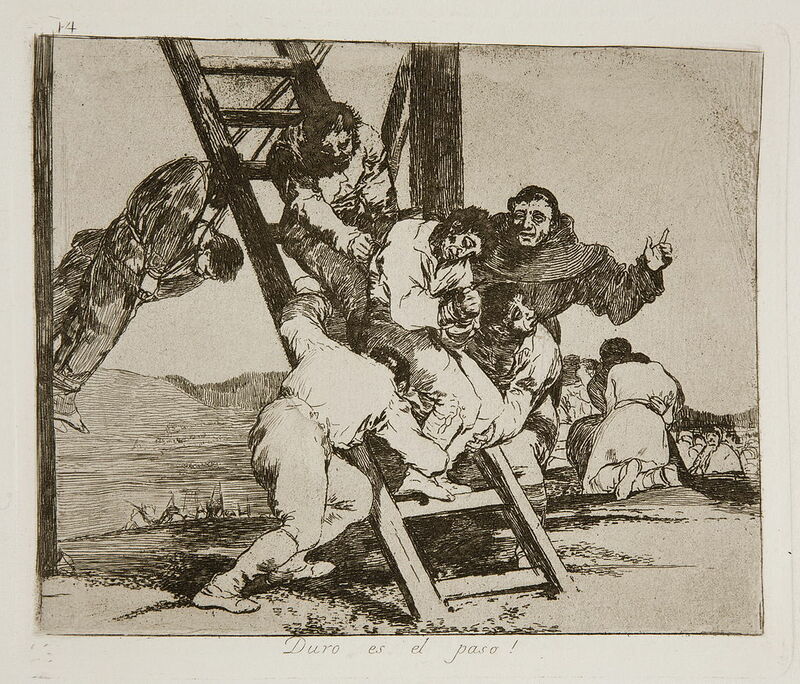 The series, he said, consisted of pictures which "normally find no place in commissioned works". 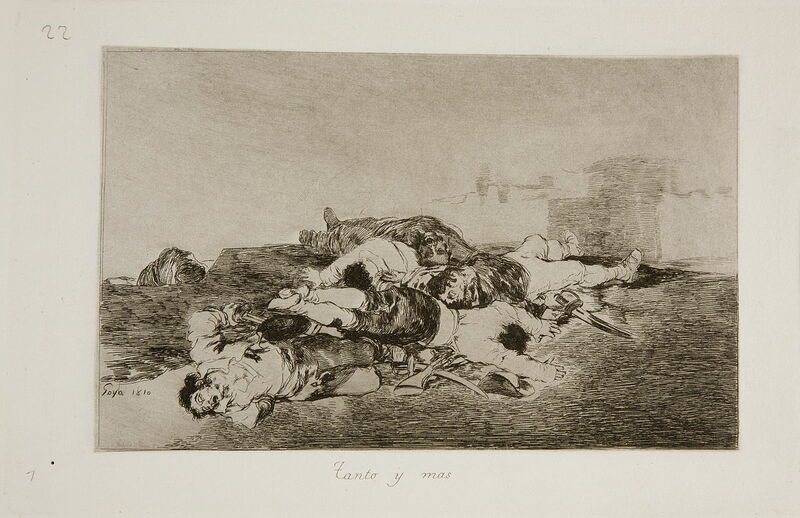 The first 47 plates in the series focus on incidents from the war and show the consequences of the conflict on individual soldiers and civilians. 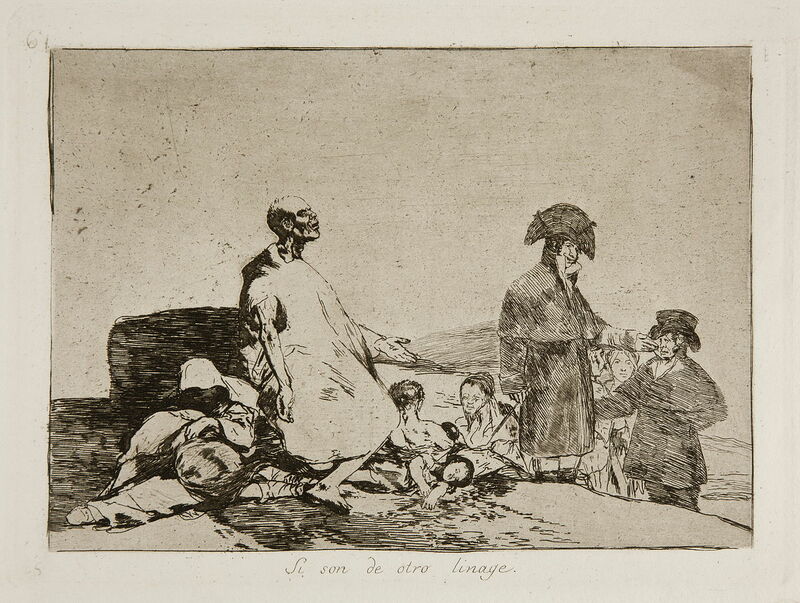 The middle series (plates 48 to 64) record the effects of the famine that hit Madrid in 1811-12, before the city was liberated from the French. 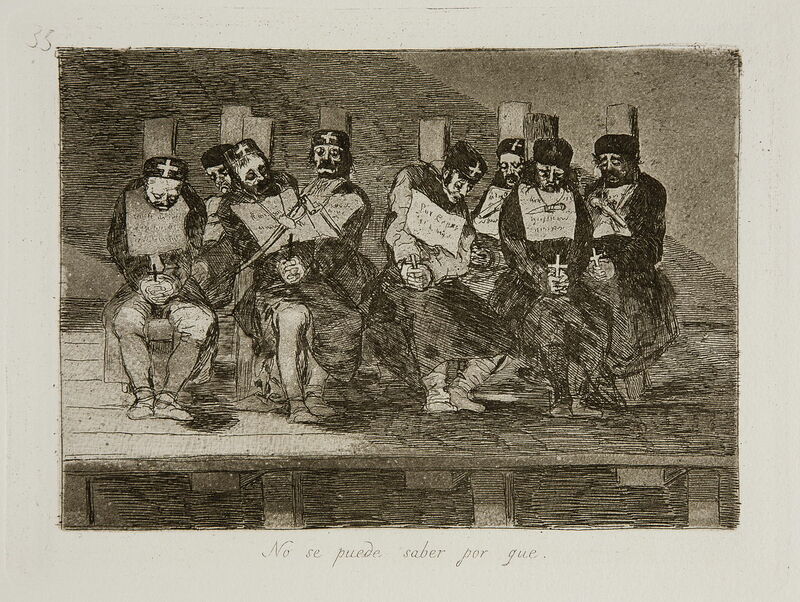 The final 17 reflect the bitter disappointment of liberals when the restored Bourbon monarchy, encouraged by the Catholic hierarchy, rejected the Spanish Constitution of 1812 and opposed both state and religious reform. 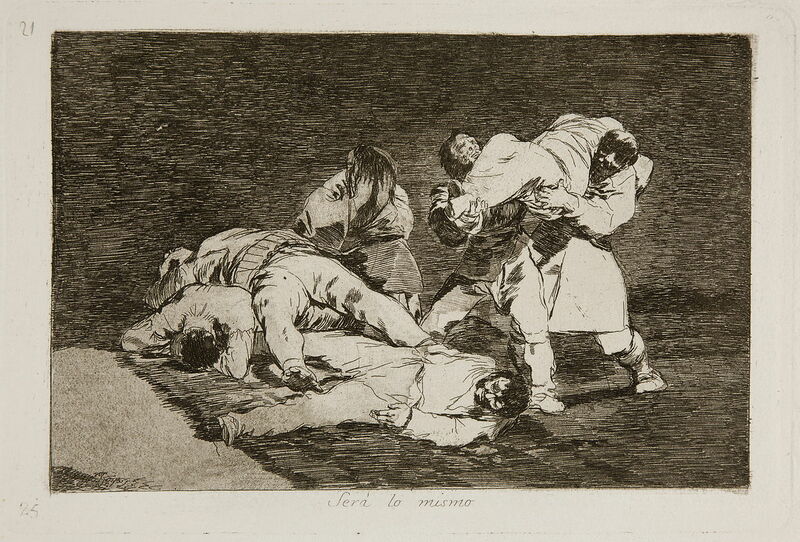 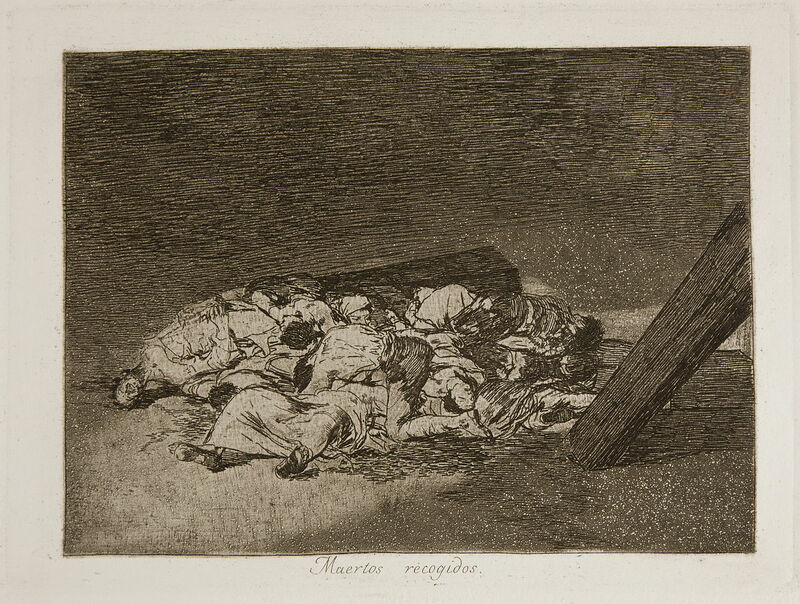 Since their first publication, Goya's scenes of atrocities, starvation, degradation and humiliation have been described as the "prodigious flowering of rage". 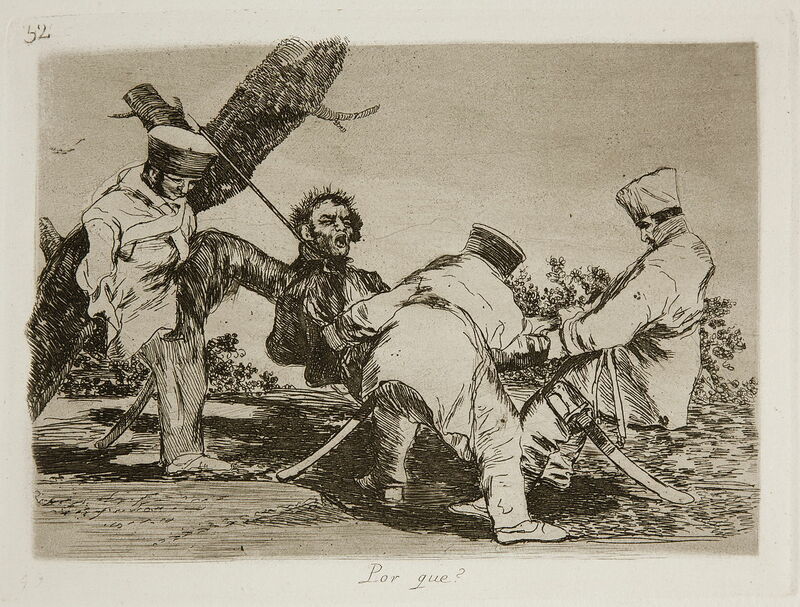 I disastri della guerra /Los Desastres de la Guerra è una serie di 82 incisioni del pittore spagnolo Francisco Goya (1746-1828), realizzate tra il 1810-1815. 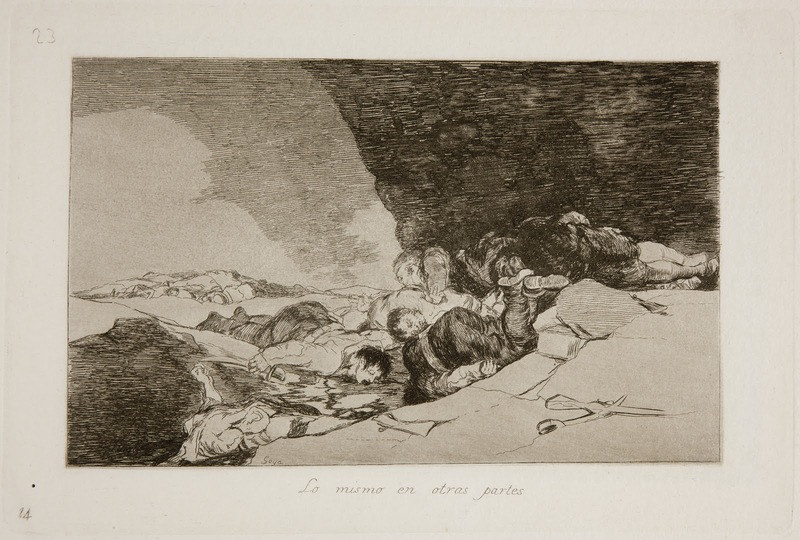 L'orrore della guerra è penetrante in questa serie. 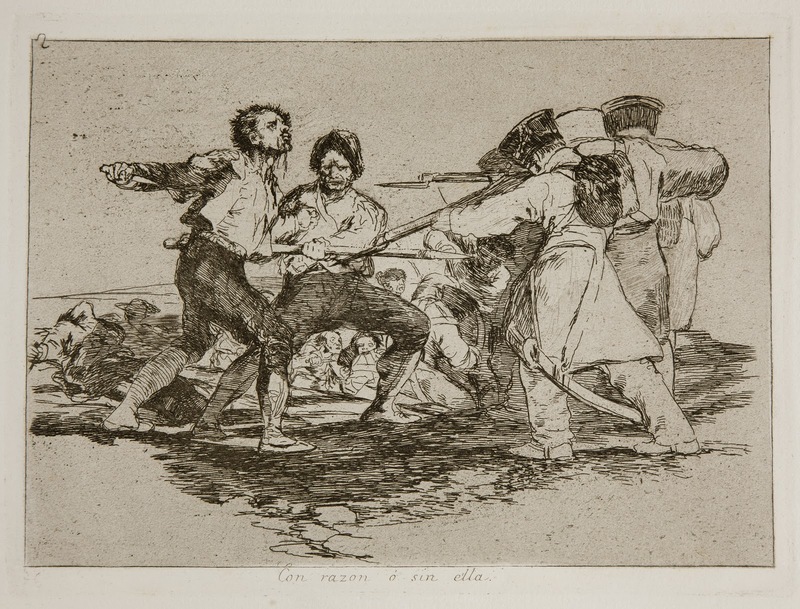 Francisco Goya ha stampato i dettagli delle crudeltà commesse nella guerra della Indipendenza spagnola. 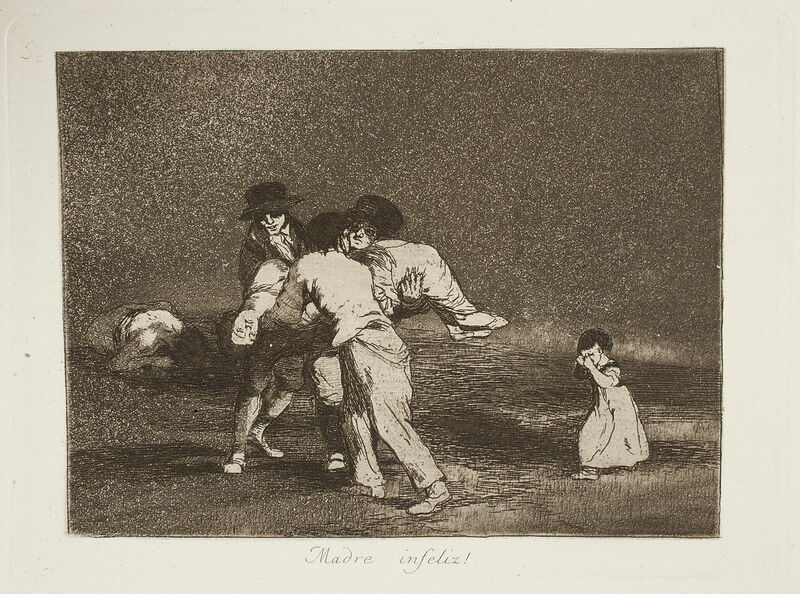 Il dolore, la fame le epidemie che possono provocare i conflitti, sono tutti rappresentati nelle matrici dell'artista spagnolo. 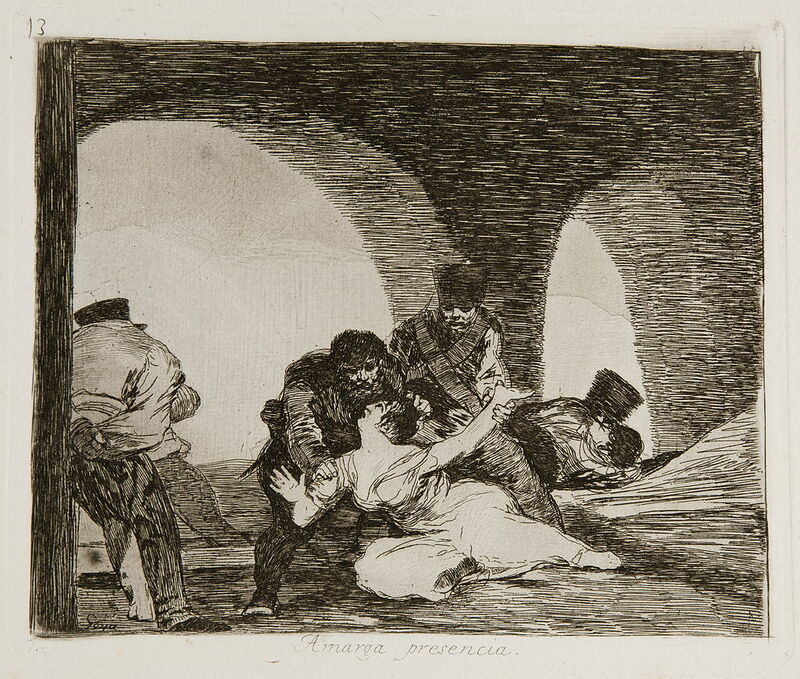 Si può avvertire ogni singolo sentimento dei protagonisti, nonché i martiri dell'immane tragedia. 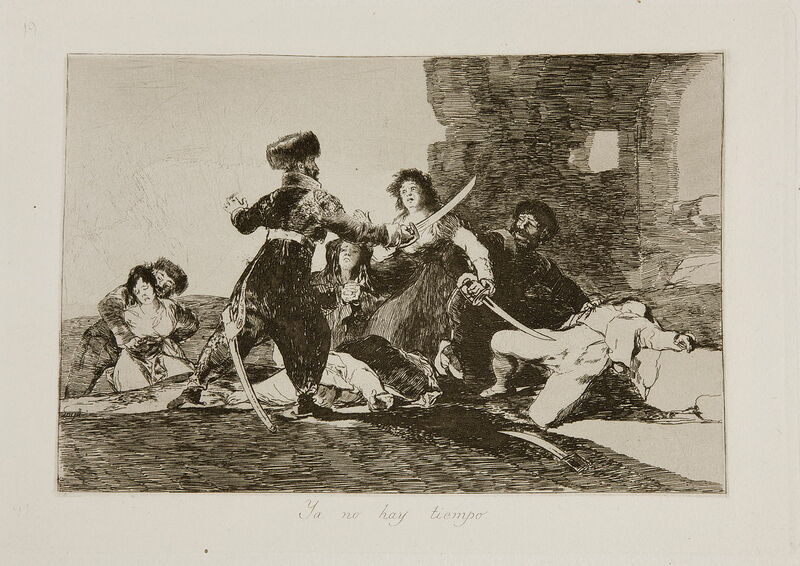 Si percepiscono le vibrazioni nei violenti e veloci tratti che la mano del maestro scaglia sulla lastra. 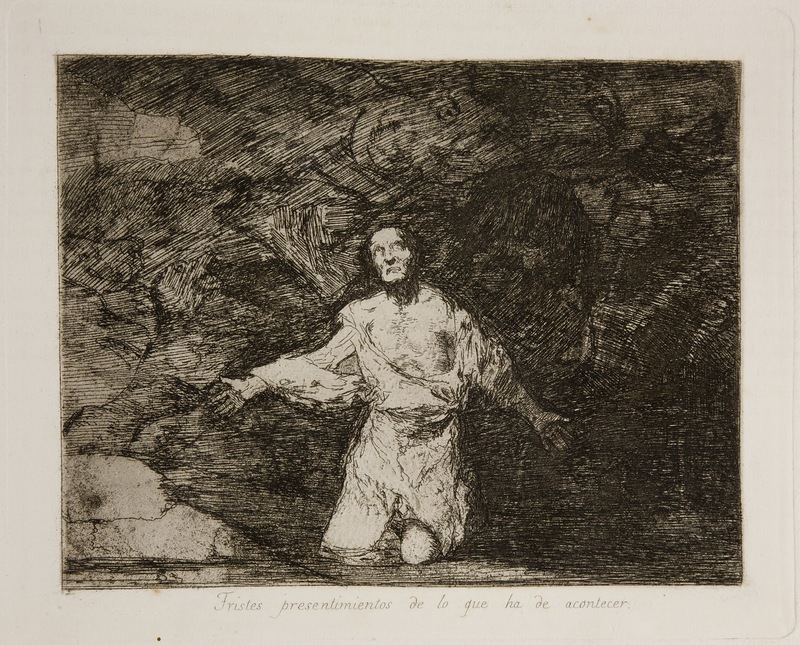 Il ciclo inizia con "Tristi presentimenti" di ciò che sta per accadere dove è rappresentato un uomo in ginocchio che implora verso l'alto, come se volesse chiedere aiuto ad un Dio, ormai inesistente di evitare l'imminente catastrofe umana che sta per abbattersi nella propria terra. 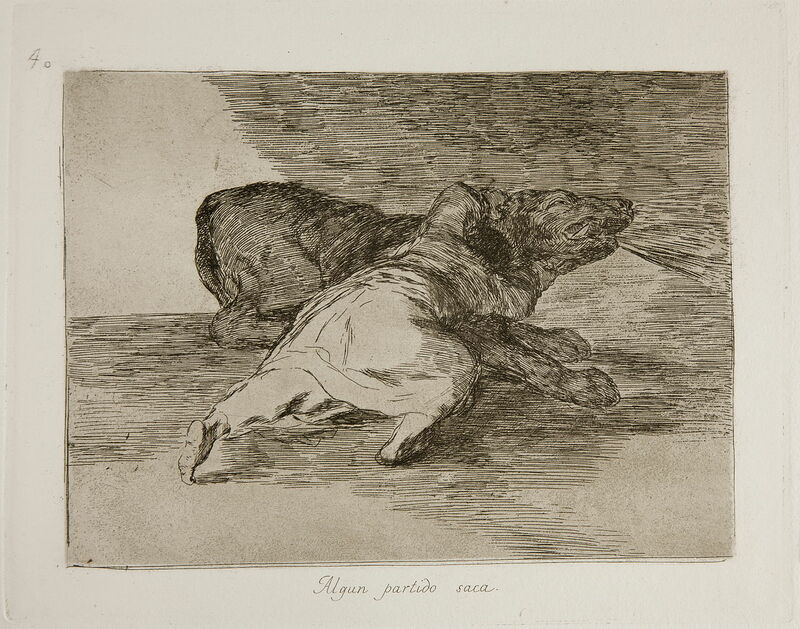 E' avvolto dall'oscurità, i suoi occhi, quasi spenti, cercano un ultimo e inutile riparo solo oltre le nubi del cielo. 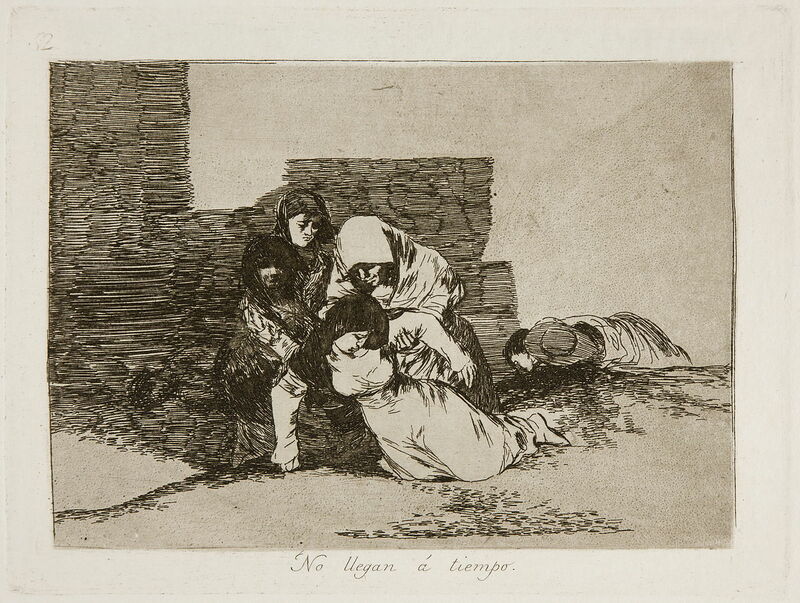 Siamo negli anni dell’occupazione napoleonica della Spagna, tra il 1808-1814. 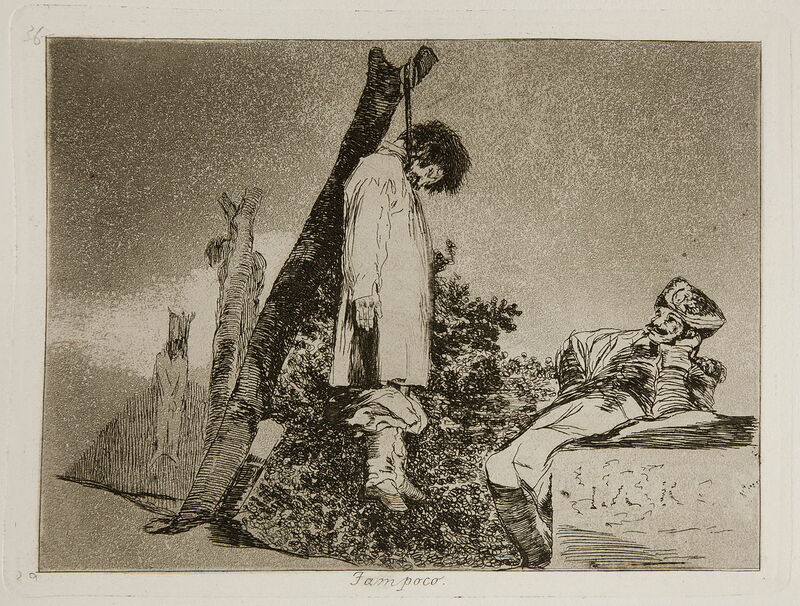 Il popolo subisce angherie, vessazioni, patisce stragi, torture, fame. 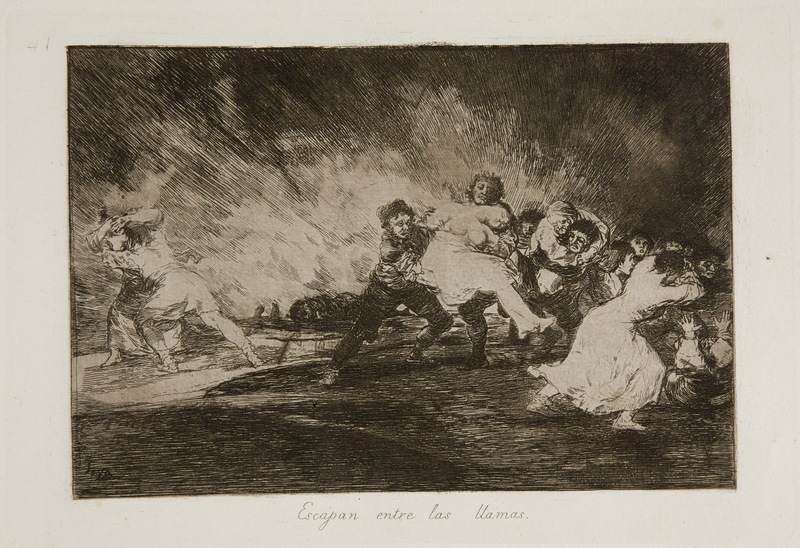 Tutto ha inizio con la fucilazione del 3 maggio 1808, fotografia della disperata resistenza dei contadini all’invasore. 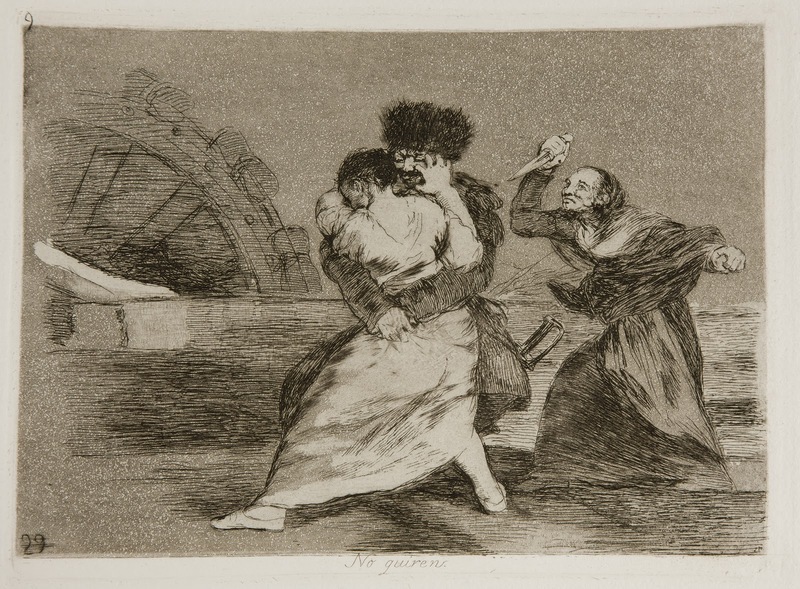 L’artista è lì, in mezzo a loro, annota ogni cosa nel suo taccuino, non si può tacere la vergogna, bisogna che l’uomo sieda di fronte a se stesso e prenda atto del proprio smarrimento. 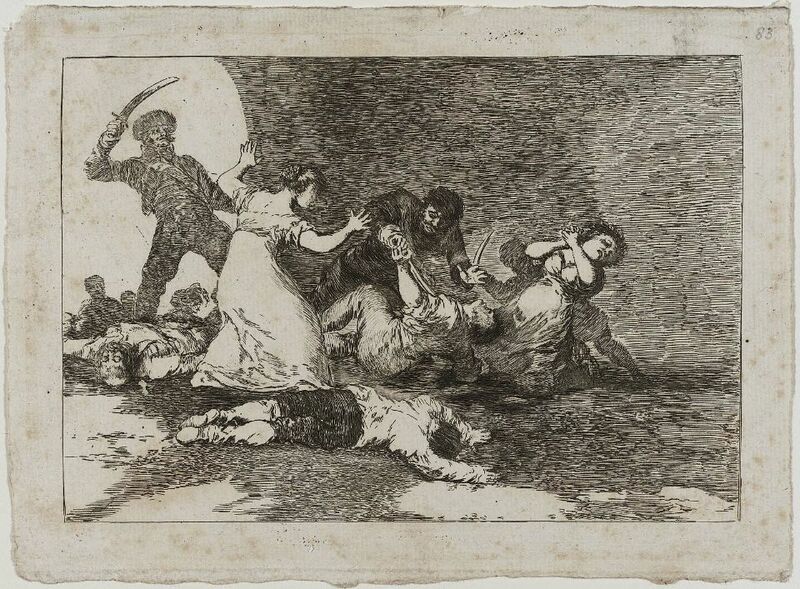 Così Goya scende all’inferno e, dal 1814 in poi, saccheggi, assassini, stupri rivivono tra le sue mani. 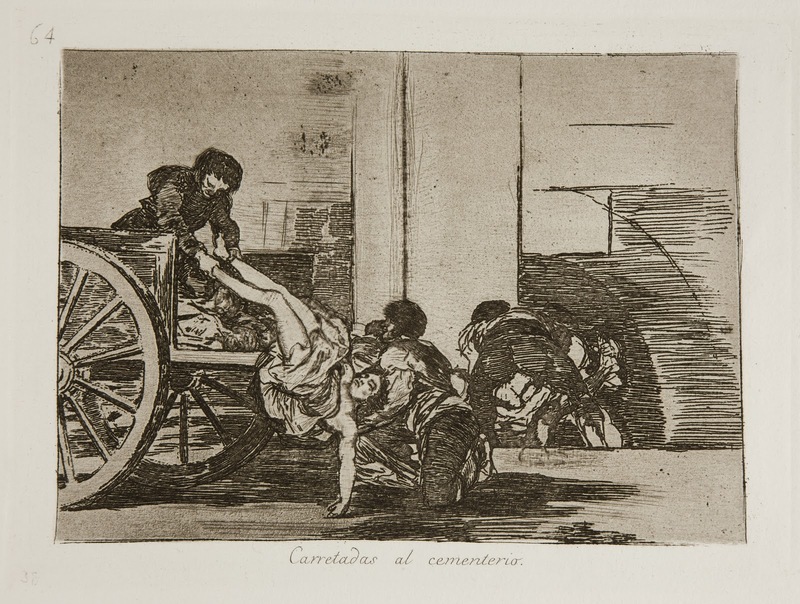 Tutta quella inenarrabile densissima tragedia trova il modo di rappresentarsi. 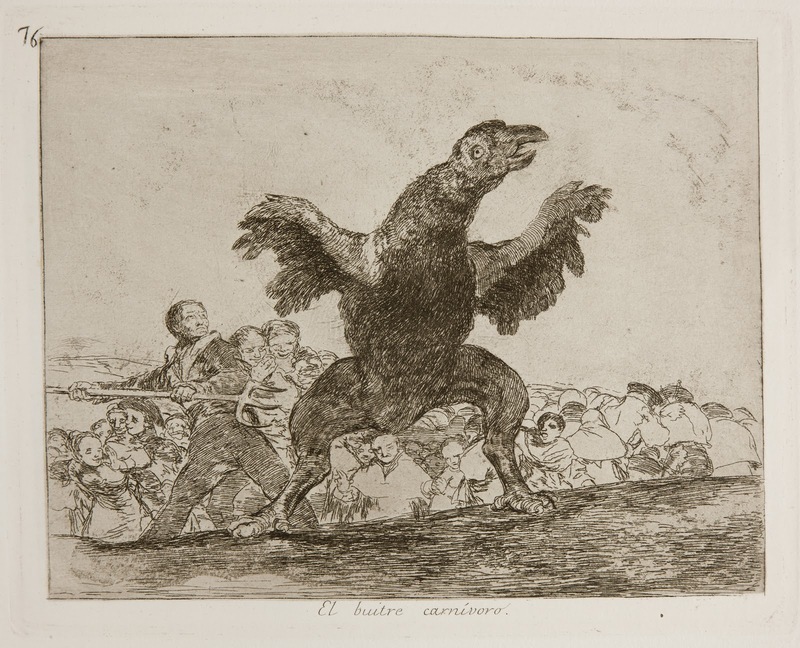 Ma non è un viaggio che l’artista compie restando a casa. 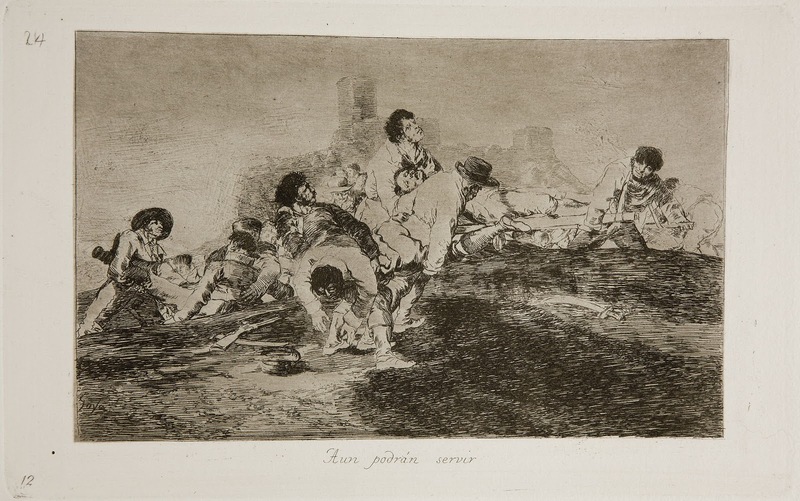 Deposte le armi in patria, dove l’aria si è fatta ormai irrespirabile, allorché dopo l’occupazione straniera tornano a farsi avanti oscurantismo e Inquisizione, il lavoro prende vita nei sei anni di esilio volontario a Bordeaux. 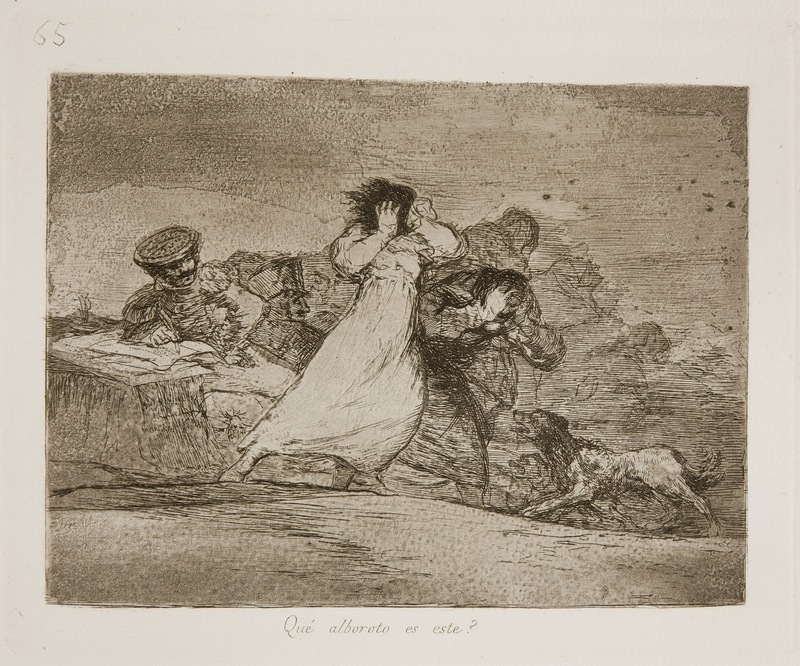 Al 1820 si contano ottantacinque acqueforti che compongono una sorta di quaderno-poema dal titolo di Fatali conseguenze della sanguinosa guerra spagnola contro Bonaparte. 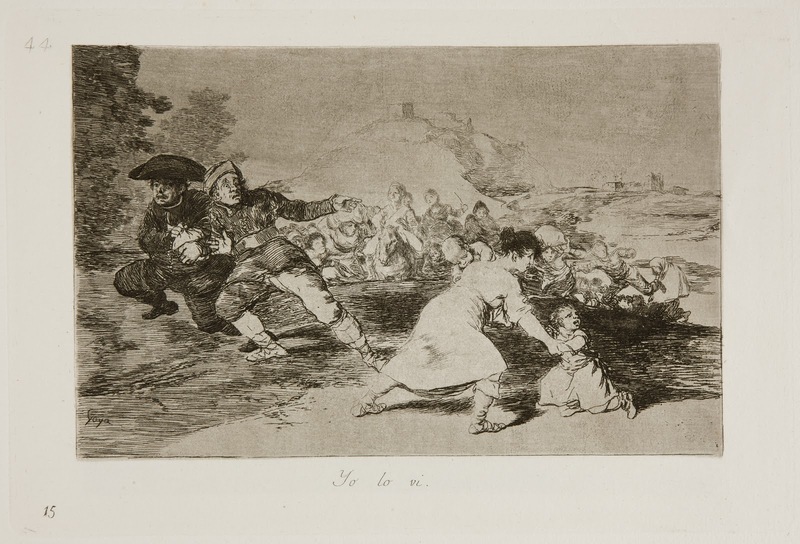 E altri capricci enfatici. 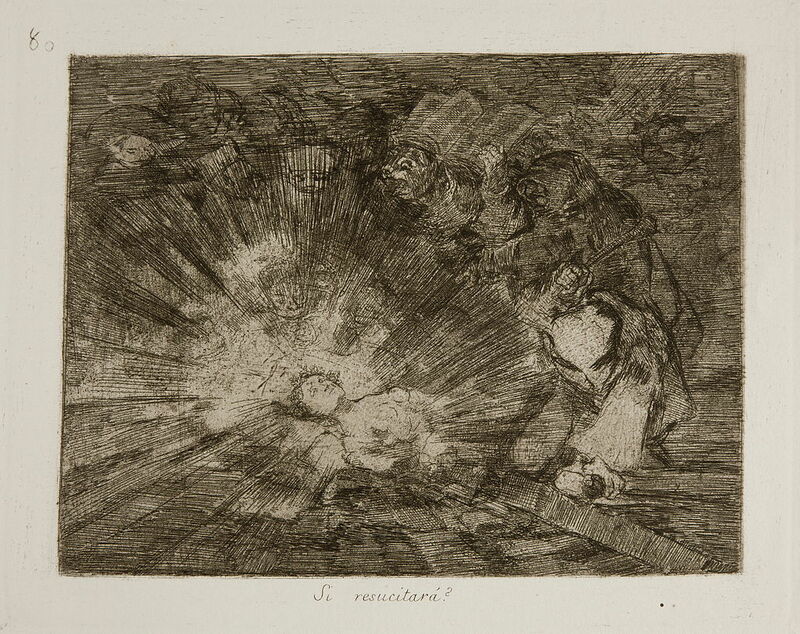 Epilogo del dramma e dei suoi spettatori che hanno assistito attoniti all’esodo di un’umanità in fuga. 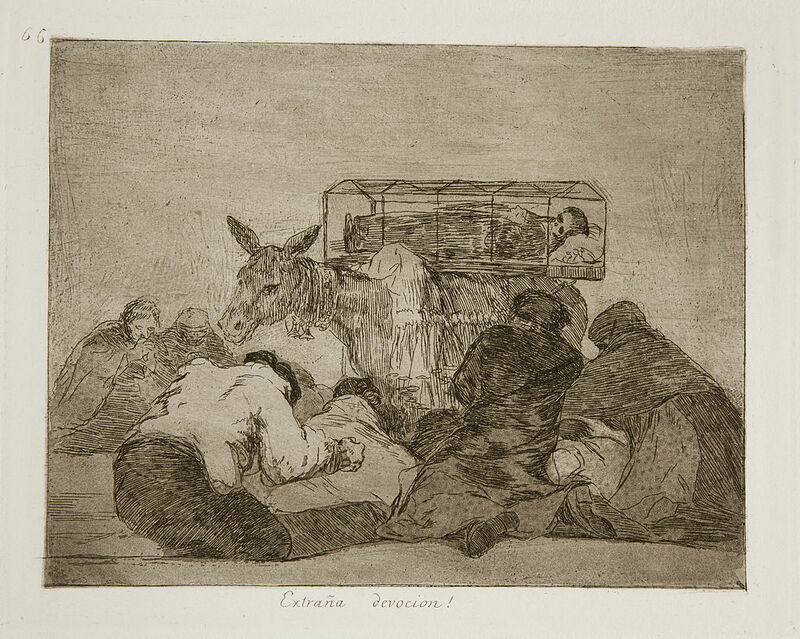 coscienza del valore della dignità umana che è meravigliosamente analizzata nella serie dei Disastri.